A developing cold and general lassitude meant that I did not get my act together to pack for my planned backpack. Throughout September I have been working five day weeks, a total shock to the system after a couple of years as a part timer. A quick text to Chrissie and it turned out that her planned backpack had also failed to materialise. 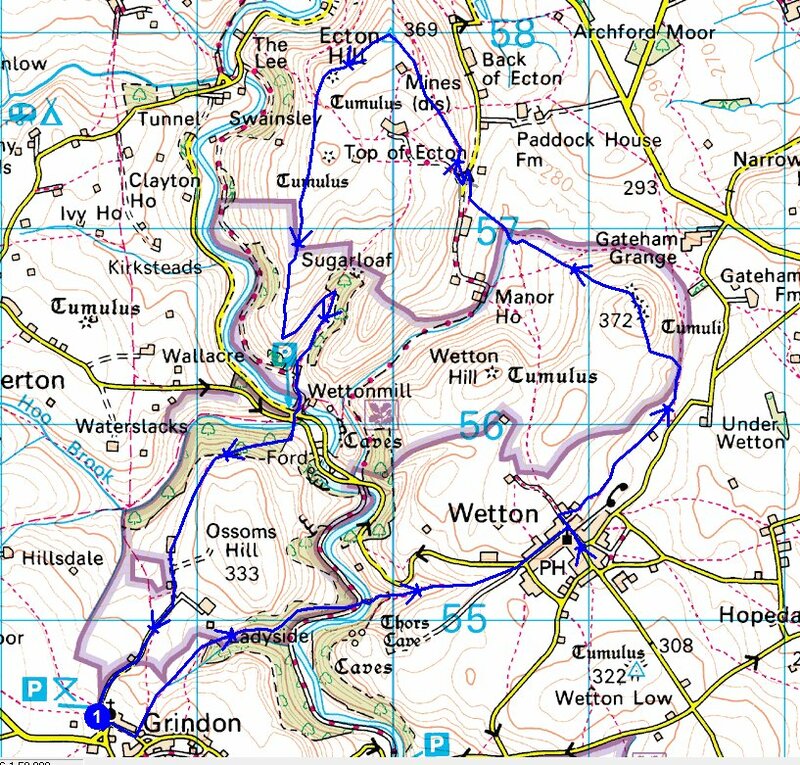 I hastily planned a day walk and we agreed to meet at the church in Grindon the following morning. 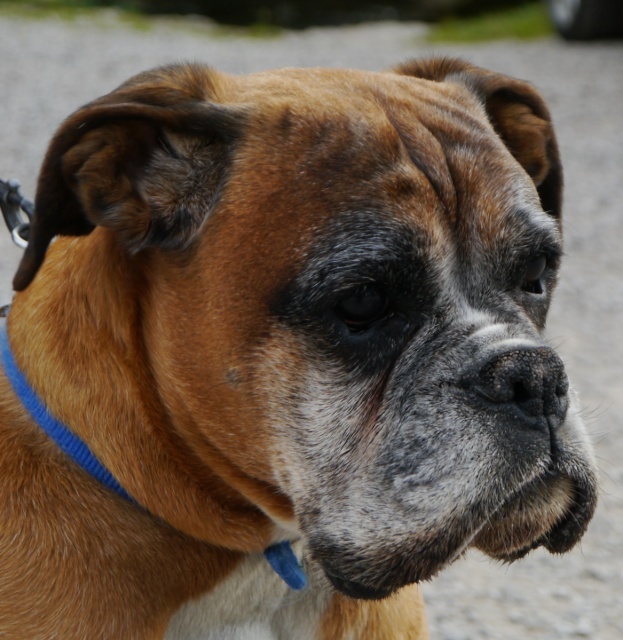 I think that Reuben can sense when the drive is coming to an end, his walk in the hills being imminent. As soon as I turned off the main road he woke up and got excited, nose smearing muck across the back window. The car park next to the church in Grindon is free, a huge thumbs up in my eyes. 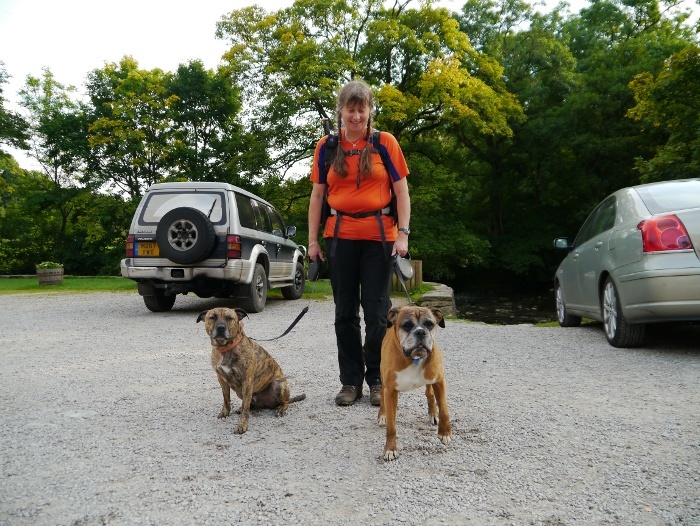 I pulled into the last space, Chrissie already waiting with Dixie. 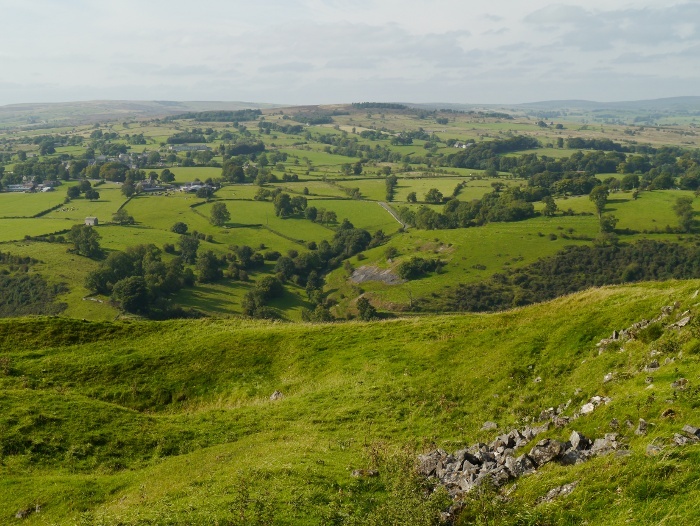 I had planned the walk to give an easy start to the day, the Staffordshire village of Grindon being situated high on the limestone plateau. 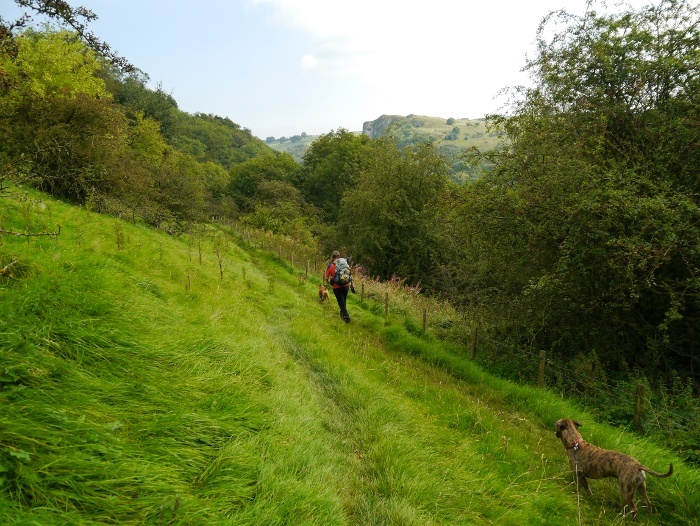 This meant that we initially walked downhill into the picturesque Manifold Valley. 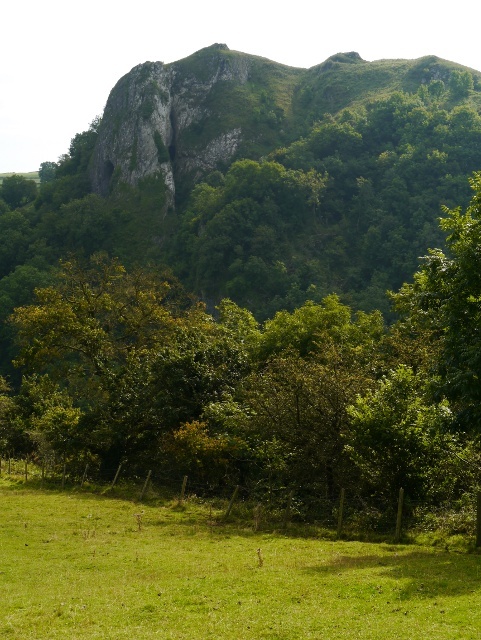 This part of the Manifold is dominated by Thors cave, from this angle looking inaccessible in the limestone high above the valley. I could make out a couple of figures standing on a small grassy knoll high above the vertical cliff. 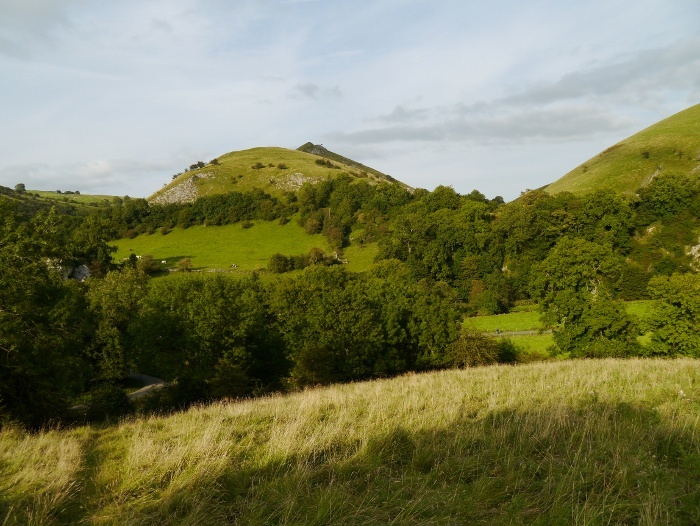 I climbed up there from Wetton village many years ago. 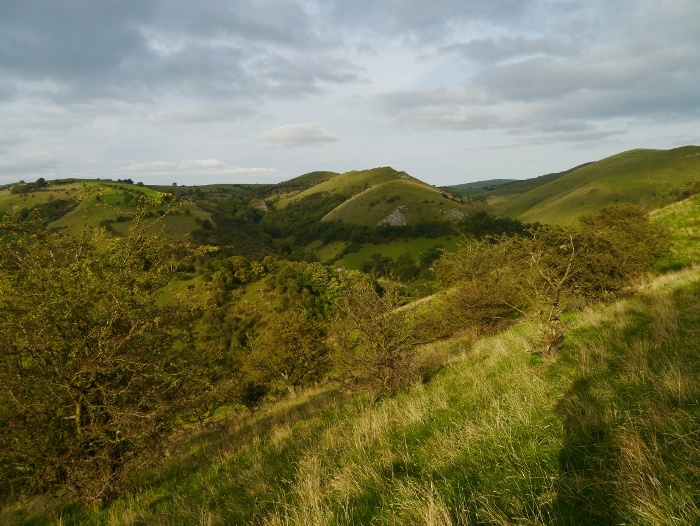 The views are impressive and vertigo inducing, the Manifold valley curving below your feet. From the bridge above the bone dry River Manifold, Thors cave reminded me of the Karst hills of South East Asia. The wooded slopes below were luxurious in their growth, one large specimen feeling the full force of gravity. I bet that made a big noise when it came crashing down. Or did it? Was there anyone around to hear it? 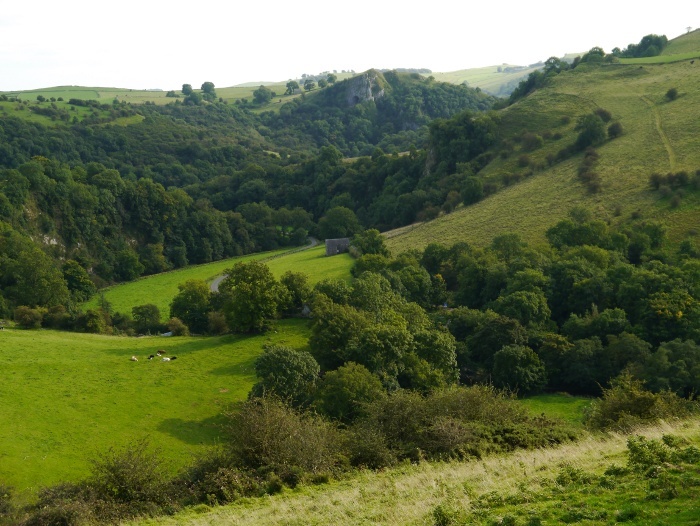 Our next destination was the village of Wetton, high above the other side of the valley. It was a steep climb through the woods until we reached open pastures, the spire of Grindon church visible on the horizon. Although mid September it had turned out to be a hot day and we were already getting low on water for ourselves and the dogs. The sensible thing to do was head for the pub for a nice sit down and a cold drink! 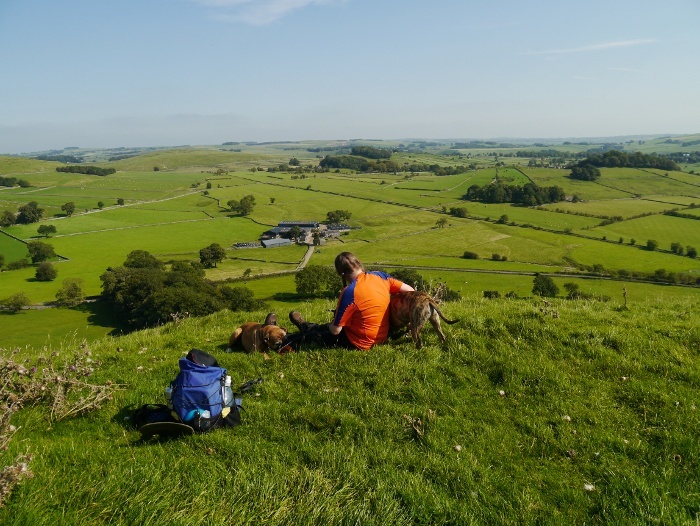 Wetton is another picture postcard White Peak village, full on this sunny day with DofE teenagers. Once again this award scheme was doing its best to put them off backpacking for life by making them carry inappropriately huge rucksacks. 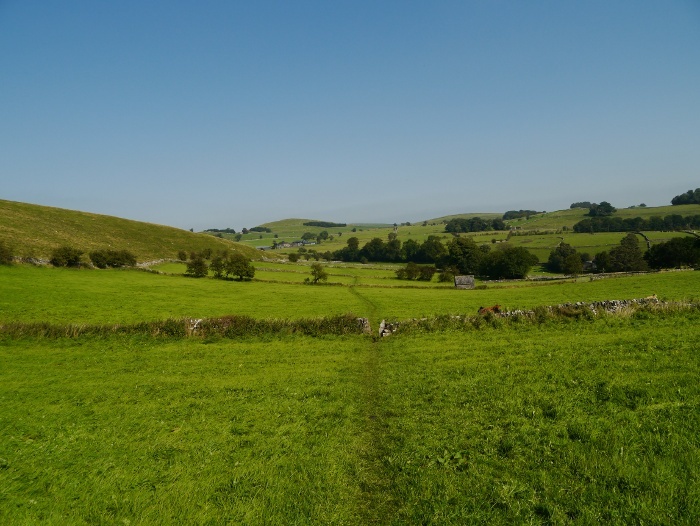 A path led out of the village, passing though a network of narrow fields under the bluest of skies. 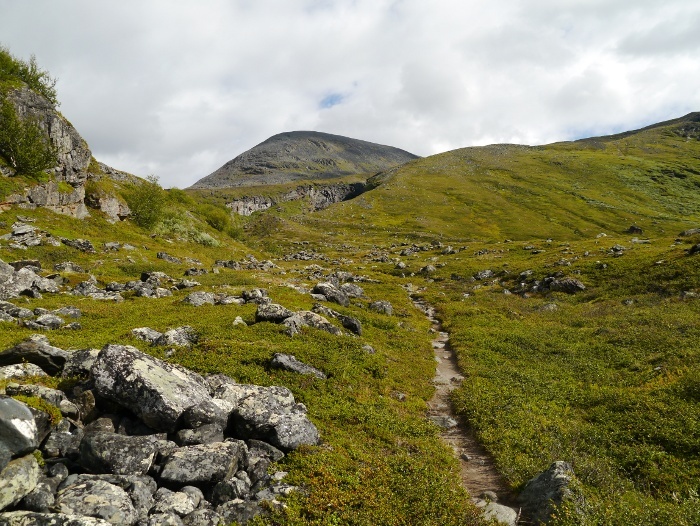 The path led us to the edge of access land, steep grassy slopes rising to our left. 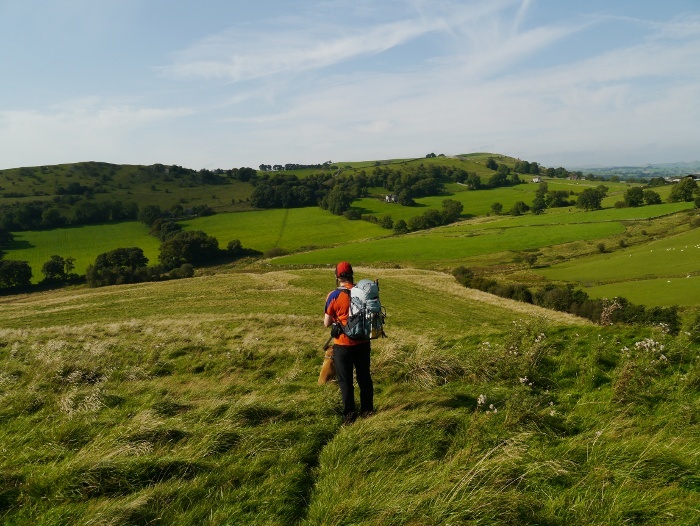 We headed straight up through the thistles, false summit coming after false summit until we got to the 371 metre east top of Wetton hill. For such a low hill it really punches above its weight in terms of views. 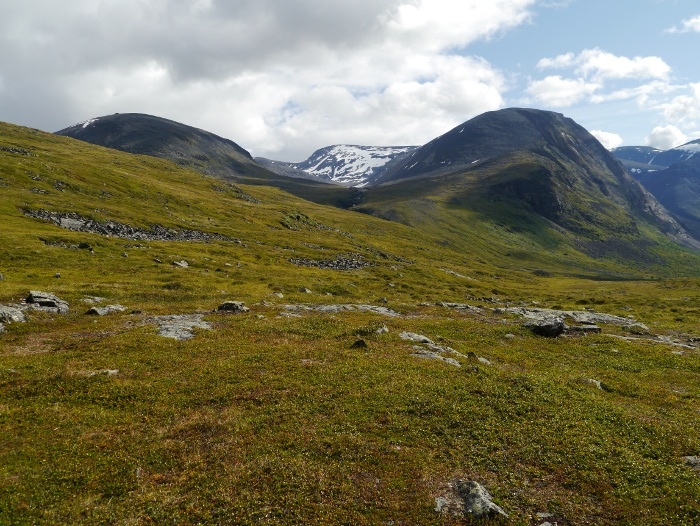 An isolated grassy dome amongst the limestone plateau, the views in all directions were outstanding. A perfect spot to sit for a while in the warm sun and eat lunch. Bellies satisfied we walked down the wide north west ridge, Reuben looking pretty unhappy with the amount of thistles hidden in the grass. Our destination was the trig point on Ecton hill. 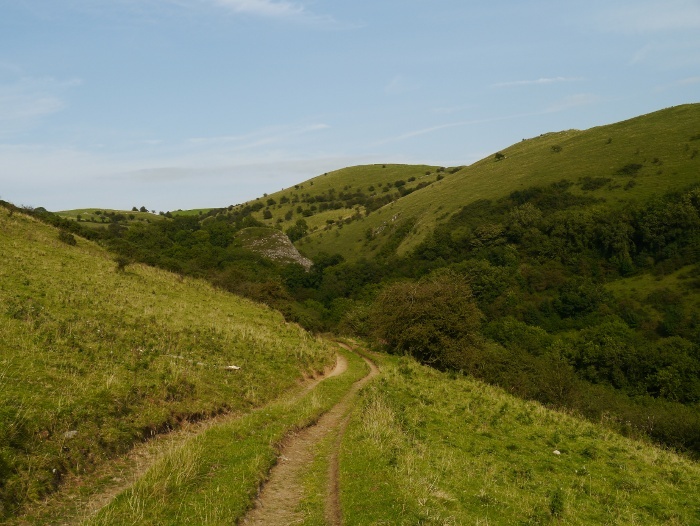 We were soon climbing again, first along a steep lane, then across open pastures on a network of concessionary paths. I like the open aspect of this part of the landscape, a good breeze managed to air the sweaty bits that had developed on the climb. 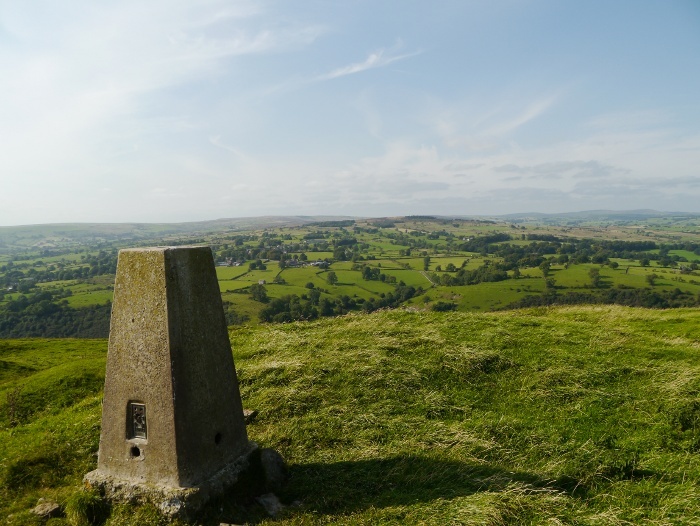 The trig point gave us another outstanding view. We did not need to persuade each other to have another sit down to take it all in. Prominent was the moorland hill of Revidge, a spot I have not yet visited. On the horizon were the bleak moors above Buxton. 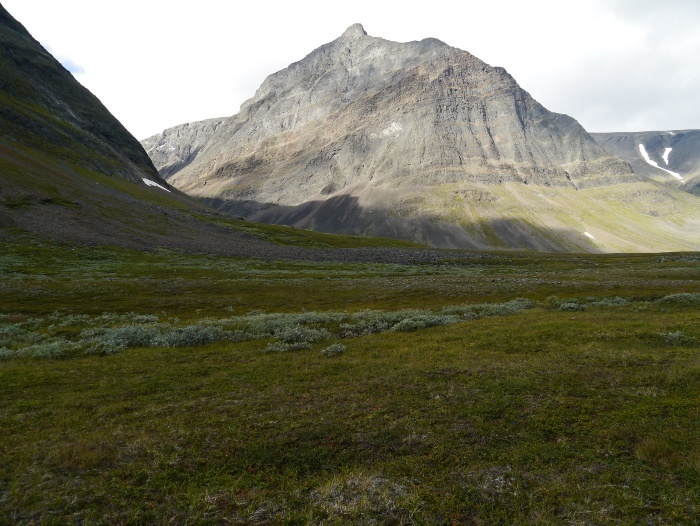 We headed south along the escarpment that plunges steeply into the Manifold. 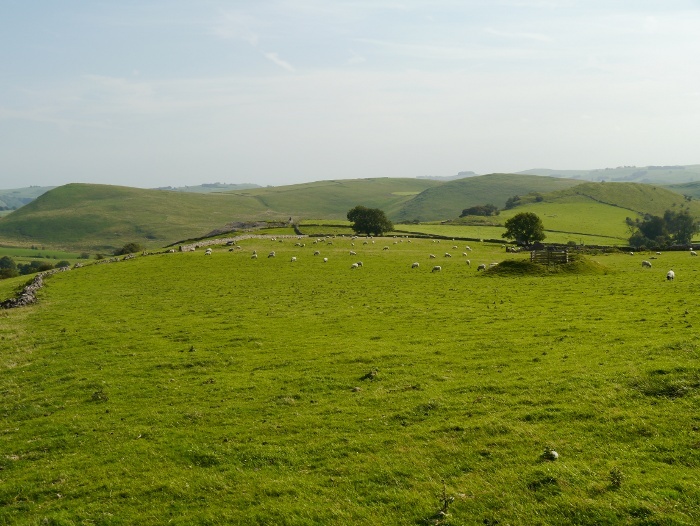 For me the best walking in the White Peak is along the edge of the access land, high above the dales. 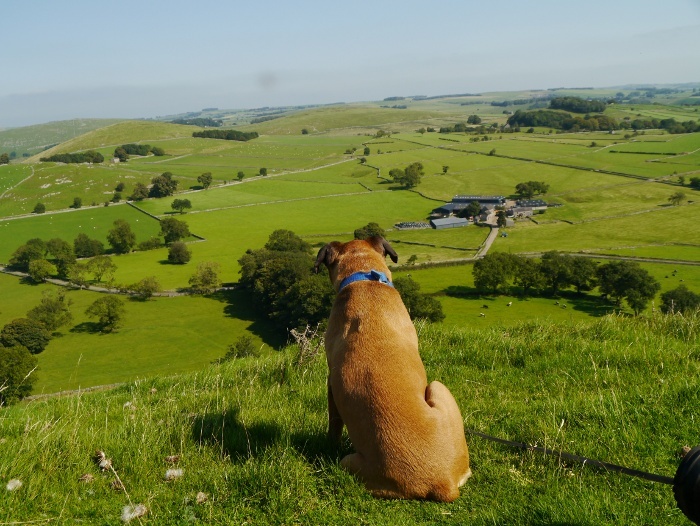 You get to see a different perspective to these well know and popular valleys. 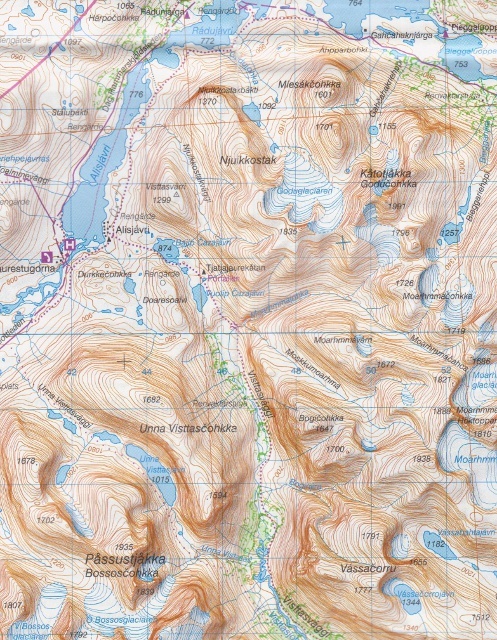 A combination of chatting, looking at the views but not looking at the map meant that I missed the right of way. Not by a bit but by several fields! We had strayed outside of the access land so continued down the ridge hoping that gates would allow easy access. 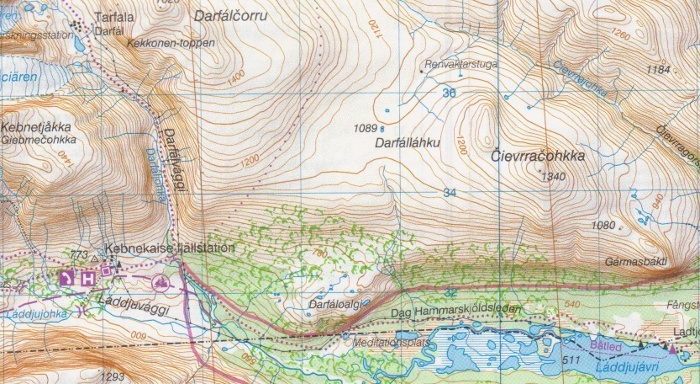 Thankfully they did and we were soon back on the yellow shaded area of the map. 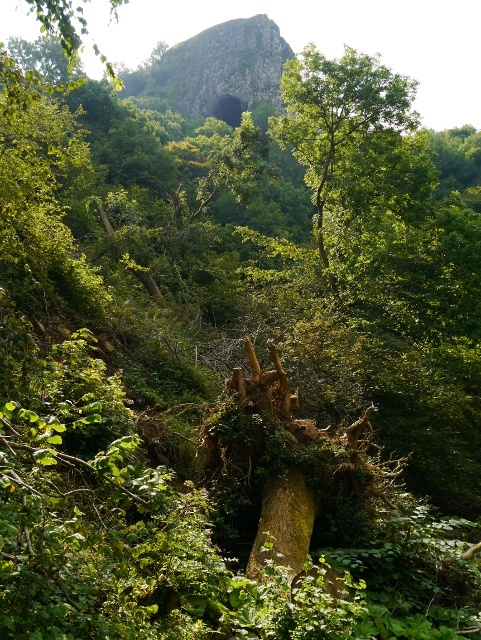 Thors cave once again came into view above the thickly wooded valley. 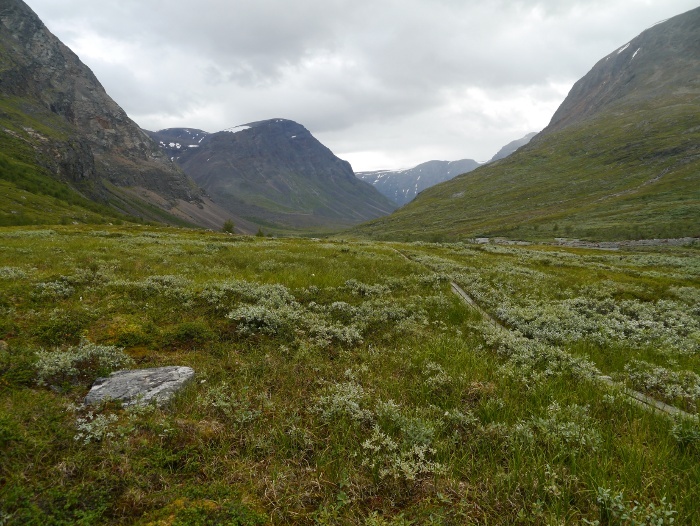 A track switchbacked into an un-named dry valley which has some form of limestone knoll in the middle of it. On the other side rose the sugarloaf, unfortunately only half of it being within open access land. From some angles it looks like a mini version of Cat Bells in the Lake District. We just happened to pass the cafe at Wetton mill, hopefully I did not give Chrissie the impression that it was planned. Whilst there it was felt that it would be rude not to use the facilities, so we had mugs of coffee and an ice cream each. The dogs had meaty sticks. Dixie put on one of her award winning smiles. 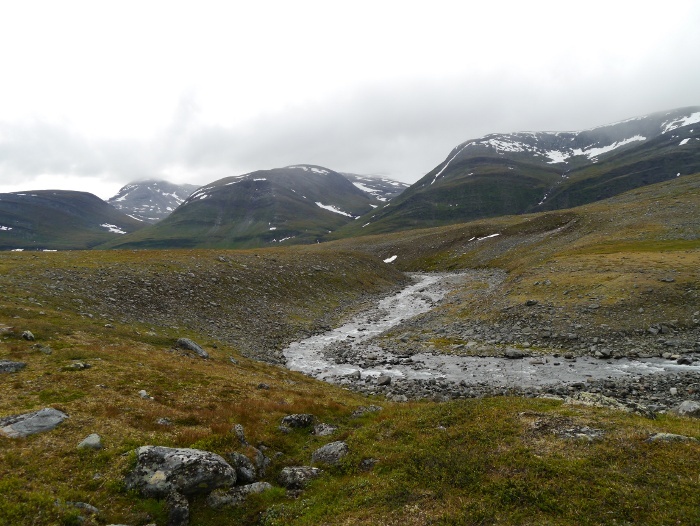 Once again we were at the bottom of the dale and needed to get to the plateau above. 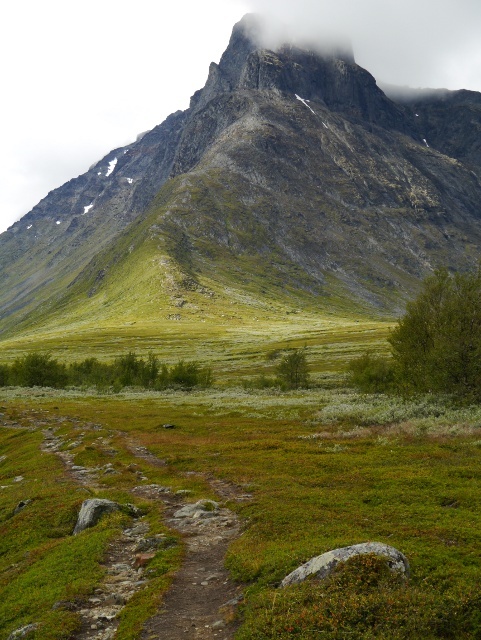 We located the footpath and followed it as it contoured steep slopes. This gave great views back, especially in the late afternoon light. 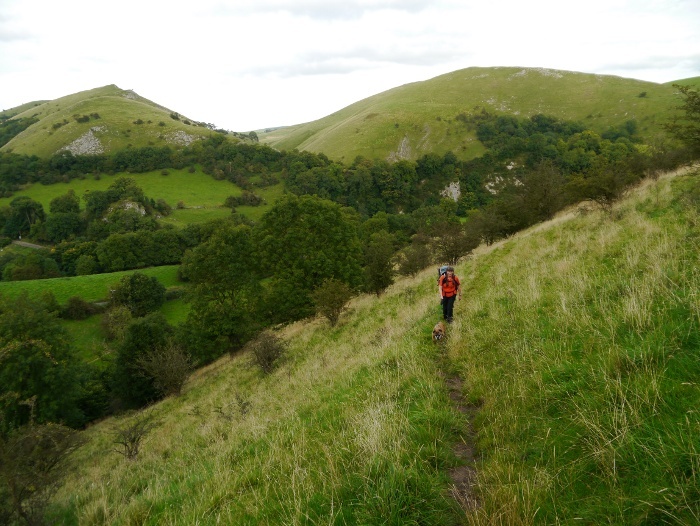 Walking in the White Peak usually means a greater amount of ascent compared to walking the higher hills in the Dark Peak. It feels that you are constantly climbing up and down, short sharp shocks to the system. Our cars were the only ones left at the car park. 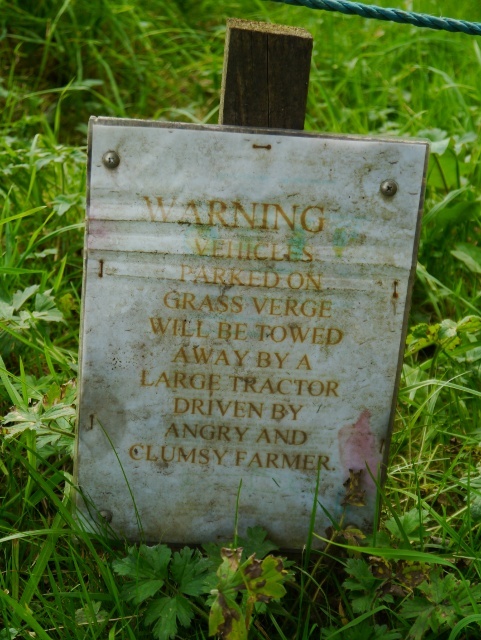 A sign placed on a verge nearby made me smile and put visions in my mind of an angry and clumsy farmer. 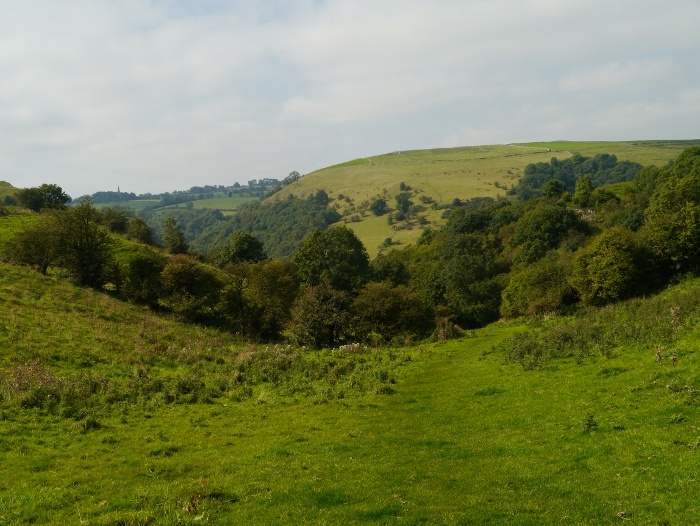 I find it hard to plan walks in the White Peak. The map appears too busy and you are never far away from a road or building. However what always surprises me when I am there is just how unspoilt it actually is. I must make more effort to return sooner rather than later, especially considering they are my nearest hills. Dawn and the man with the worlds most annoying voice was up early. 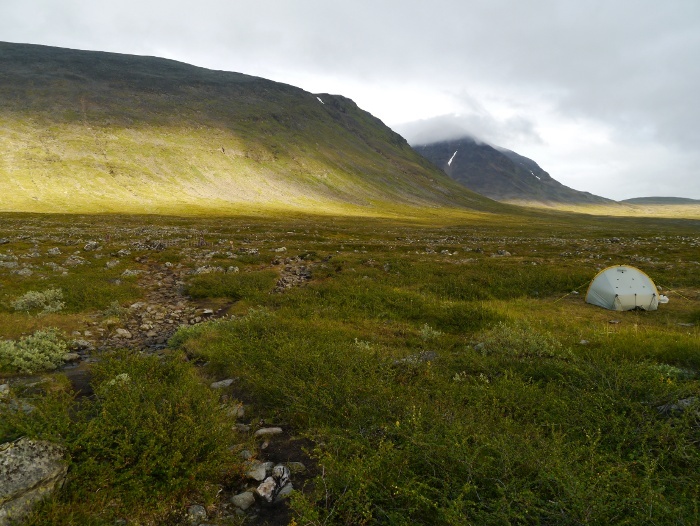 Much of the surrounding campsite was stirring, probably getting ready to climb Kebnekaise. 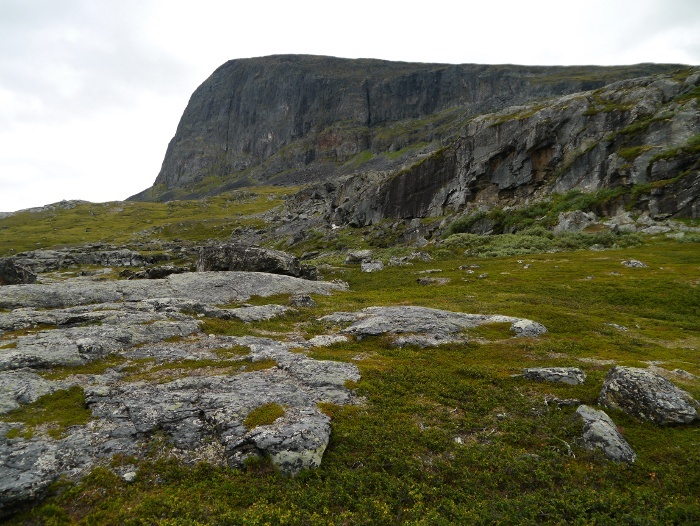 This is the highest mountain in Sweden and the main objective of many of those that visit the mountain station. After walking for one hundred kilometres I have to admit that I was really not that fussed, preferring to have a lie-in and a lazy day. 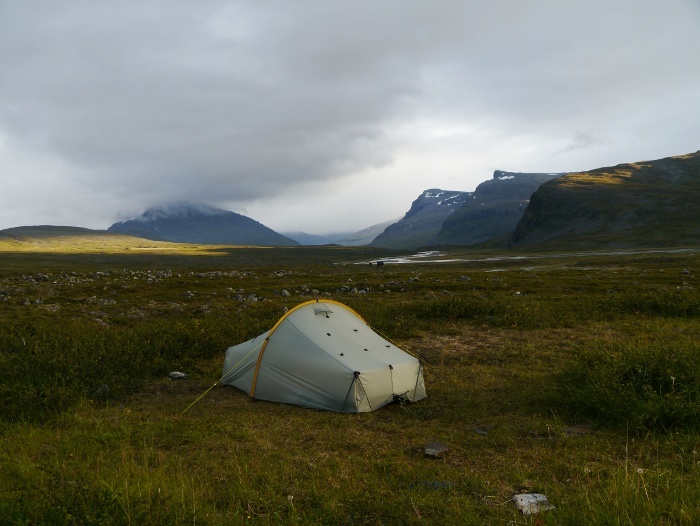 It was a cold morning and I stayed in my sleeping bag until the sun finally warmed my tent. With most of my neighbours gone it was a nice quiet spot and I sat outside for a while, drinking coffee and eating my usual camping breakfast of noodles. The peace was soon shattered by a relay of helicopters coming in to land. 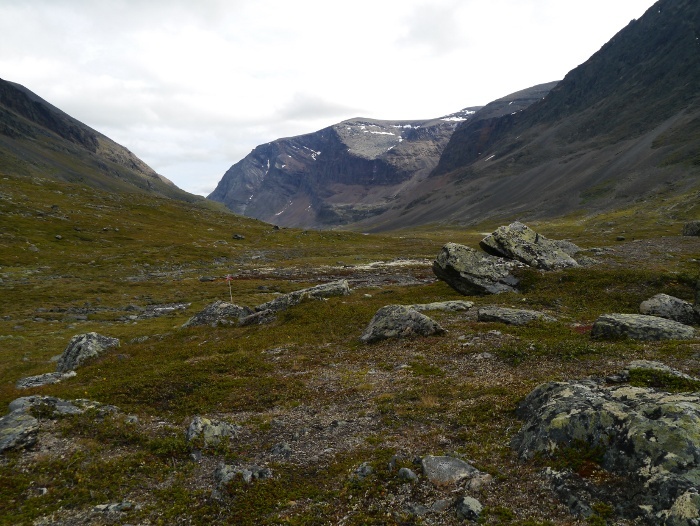 It turns out that many people do not walk the nineteen kilometres to the mountain station, instead taking a short flight. The helicopter is remarkably cheap at £50, especially if you compare it with what I had paid to shower and use the toilet! 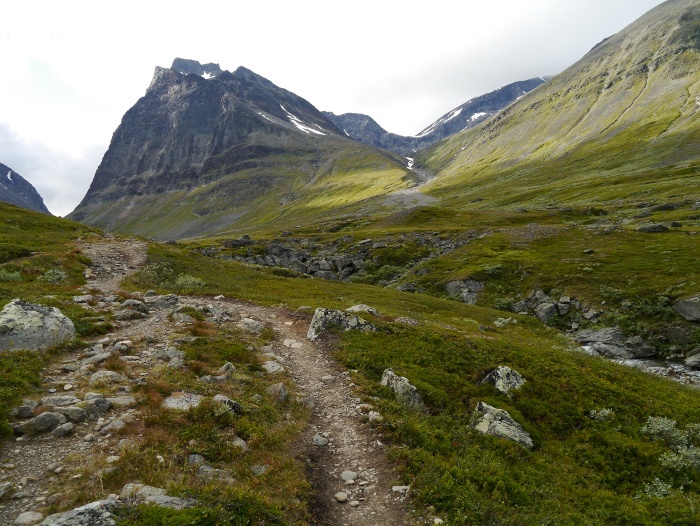 I could not wait to leave and get back on the trail, the hustle and bustle around the buildings too much. I found the place to be a bit of an intrusion in what otherwise would be a wilderness area. I shouldered my pack and set off back into the woods. 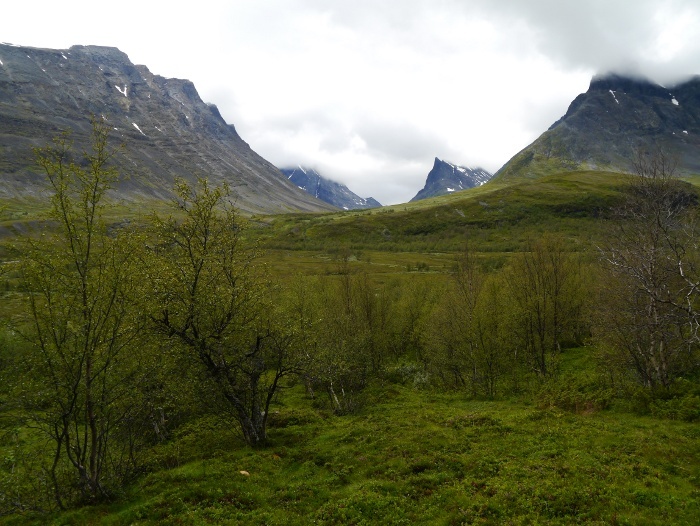 Initially the birch woods were sparse, giving uninterrupted views back towards Duolbagorni, the main bulk of Kebnekaise hidden by the lower peaks. A very impressive backdrop of mountains that would remain with me for the rest of the day. 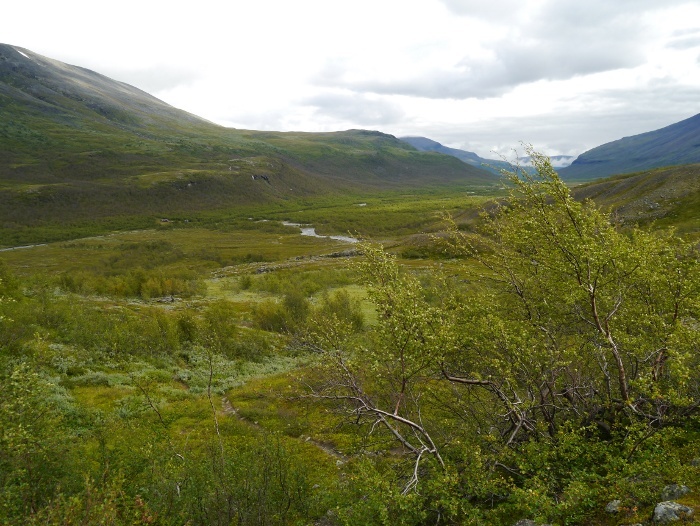 With a small drop in elevation the birch forest quickly established itself, becoming taller, the undergrowth thicker. I was once again back walking on wooden boards, they were doing a good job at preventing damage from the many passing feet. I have to admit that I soon grew to dislike the birch forest with its restricted views. 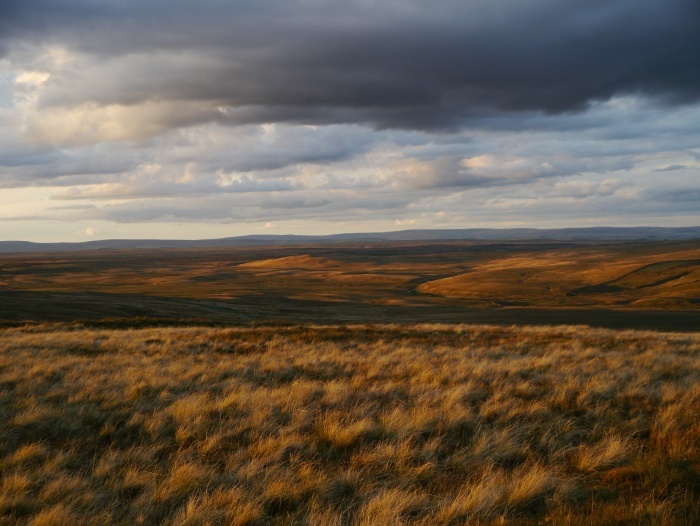 I had got used to the high open country, a sense of space and freedom. In the woods I felt a little enclosed, hemmed in, only able to move forwards or backwards, sideways movement restricted by thick vegetation. 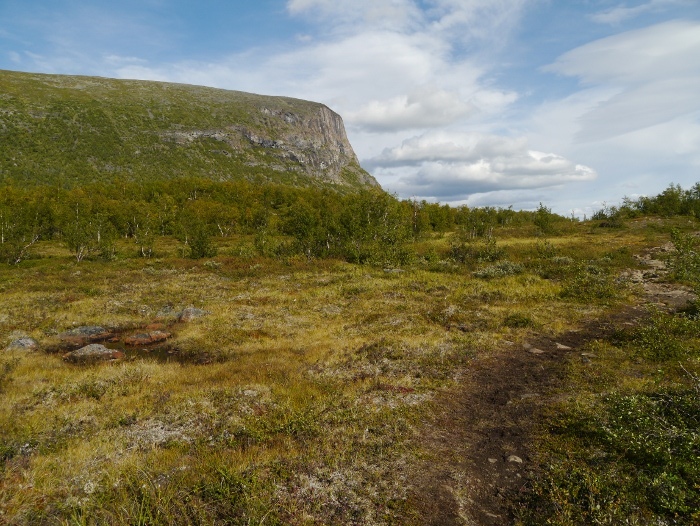 However there were still frequent open areas amongst the birch trees, small rises that gave views back towards that awe-inspiring skyline. The day turned out to be hot, the enclosed valley sheltering me from what would have been a welcome breeze. With the warmth and lack of breeze the mosquitoes came out in force. They fed on my discomfort. Sitting at home typing this I would love to return and walk that section through the forest again. 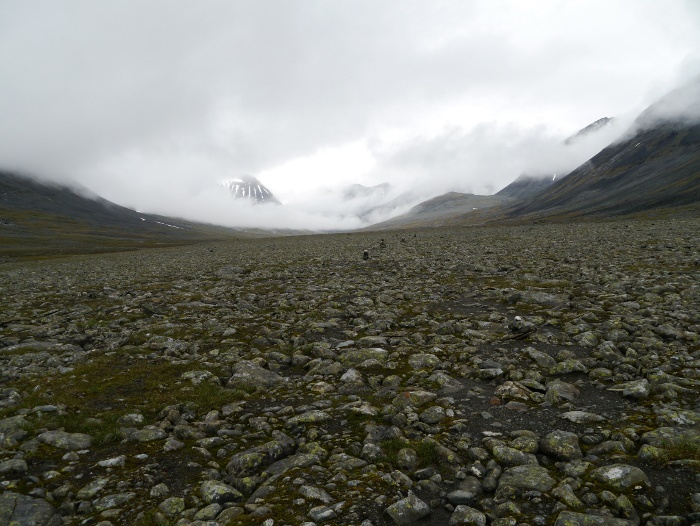 However at the time I felt that the best of the trek was over and I was looking forward to the end. I failed to savour it, instead beginning to think about the long journey home. This is common with me on any long trip, towards the end I lose the rhythm I have developed, no longer that feeling of just living in the present. The worries and anxieties of modern day living start to creep back in. 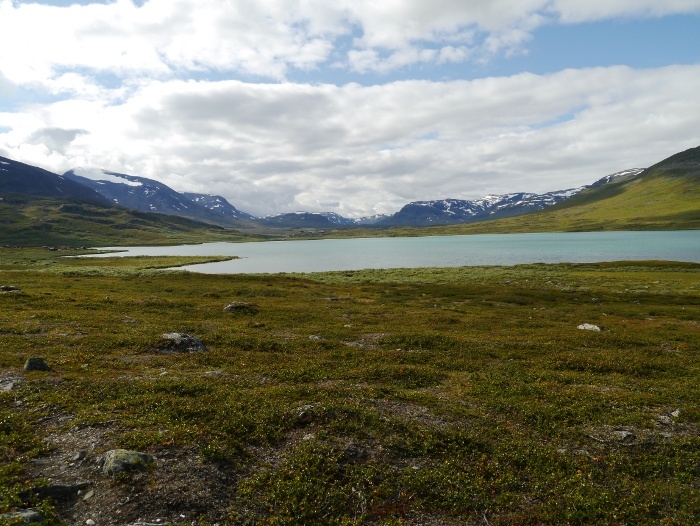 I passed the landing stage for the ferry that serves Laddjujavri lake, an opportunity to cut off a few kilometres on the walk out to Nikkaluokta. It was tempting as I am sure that the views from the small boat would have been spectacular. However after walking this far it would feel like cheating to me, I wanted to complete the journey on foot. My ‘proper’ leather boots had served me well on most of the trip, providing warmth and support during the previous few days. However in the heat on a firm forest path my feet were suffering, cooking in what felt like leather coffins. It was bliss to find an open spot with a cooling breeze to sit barefoot for a while. I wished I had my trail shoes for the next few kilometers, the open mesh would have been a welcome relief, along with the spring they would have put in my step. However they would not have suited much of my trip. Kit selection is all about compromise. 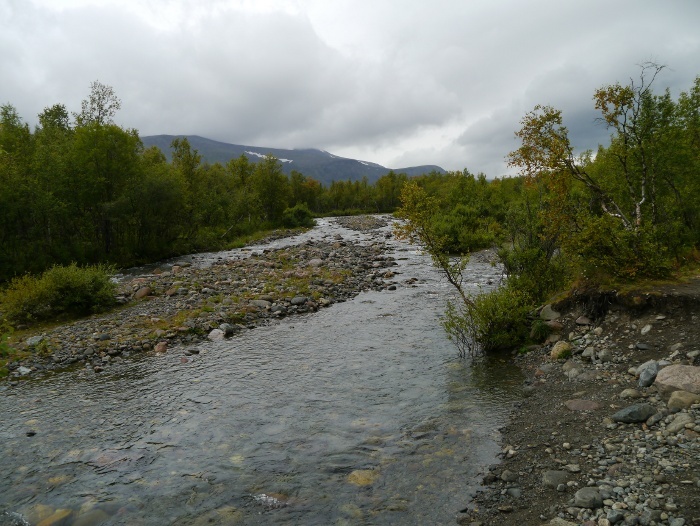 I had rough plans to end the day next to a river a few kilometres from the end of the trail at Nikkaluokta. 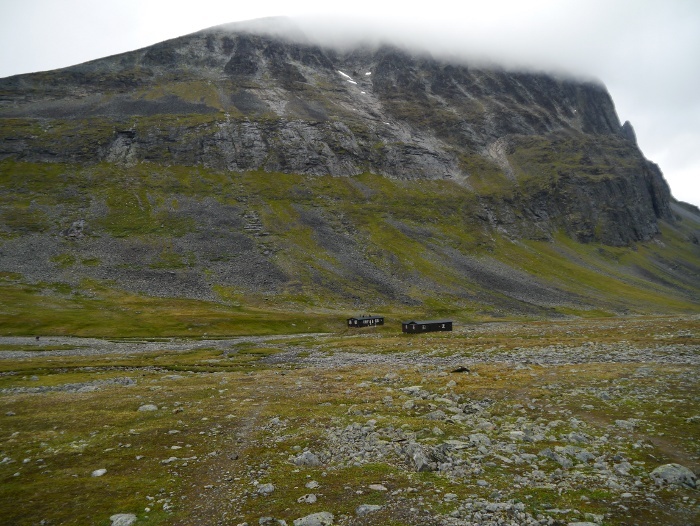 However I soon passed a sign saying that there was camping available for 80 SEK (£8). The campsite was situated spectacularly next to the lake and a cafe, the name of which caught my eye. I am happy to give my money to a business that manages to subvert the name of a pretty unpleasant multi national company. 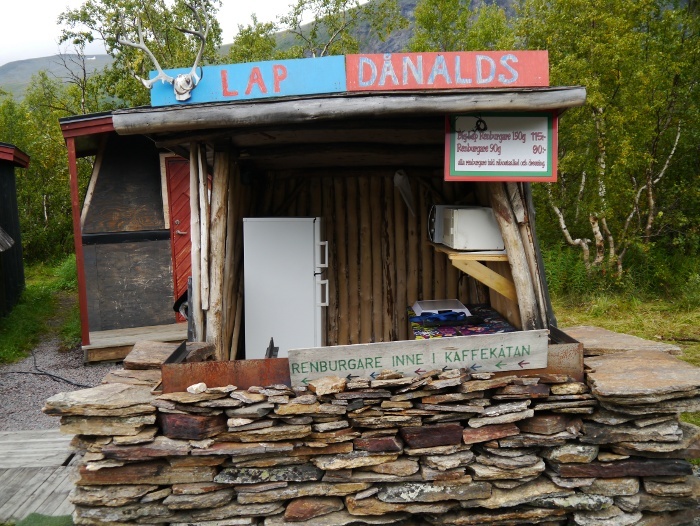 I passed on having a reindeer burger, settling for a real coffee which was appreciated after a few days on the trail. 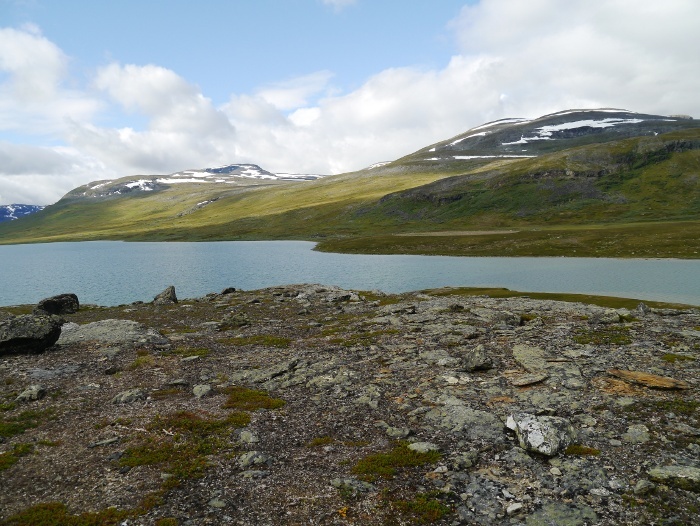 The campsite was deserted and I picked a spectacular spot next to the lake to pitch the Scarp1. There was a strong wind blowing which was a bit of a nuisance, but it did a great job at keeping biting insects at bay. I spent a pleasant evening in my tent enjoying the warmth of the sun out of the wind. I expected that the campsite would fill up but I ended up being the only person there that night. I frequently got up to walk the short distance to a stony beach. I found myself just standing there at the water’s edge, hands in pockets staring at the view. The horizon was crammed with by now familiar peaks, my mind filled with spectacular images from the past week. It was a great place to spend my last night outside before returning back to civilisation. The wind dropped in the night but it was unfortunately replaced by the gentle pitter patter of rain. I had a bus to catch just after midday and it was very important that I did not miss it. Therefore I was up and packed away by 8.30am which is pretty good going for me. The mosquitos that morning had been joined by a few midges and some small biting flies that were particularly persistent and annoying. As there was no one around to witness it I managed to do the Scottish midge dance whilst taking the tent down. 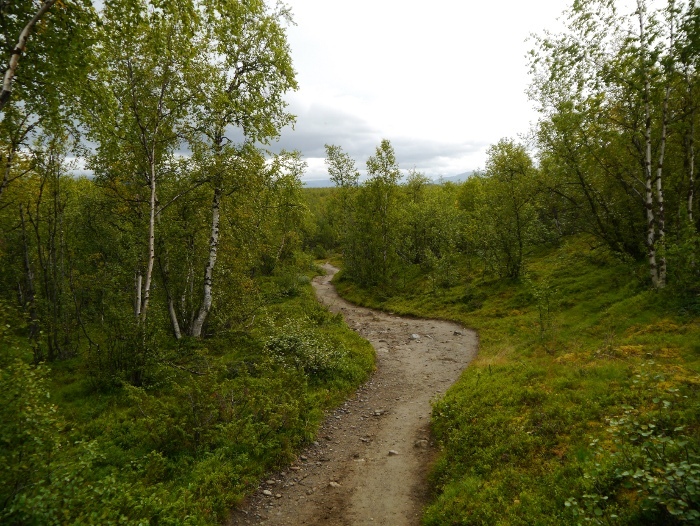 It was then back into the birch forest which felt rather humid in the damp and still conditions. Stopping for a break after an hour I was soon caught up by several groups who must have got the first ferry of the morning. 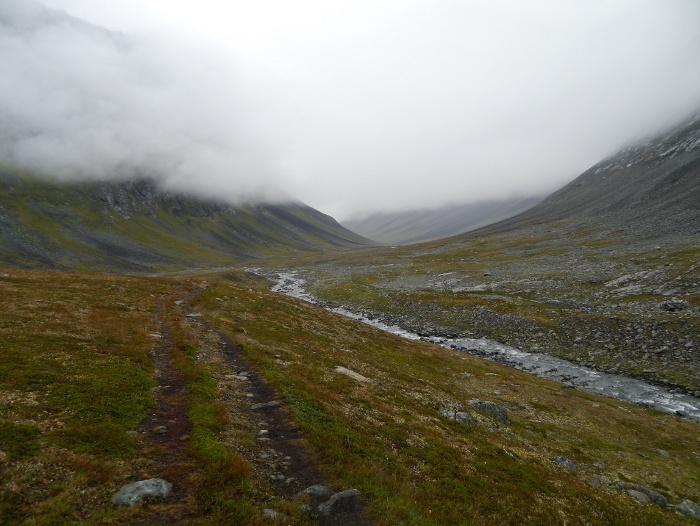 The earlier drizzle had been replaced by a cold rain as I eventually reached the end of the trail at Nikkaluokta. A passing couple offered to take my photograph. 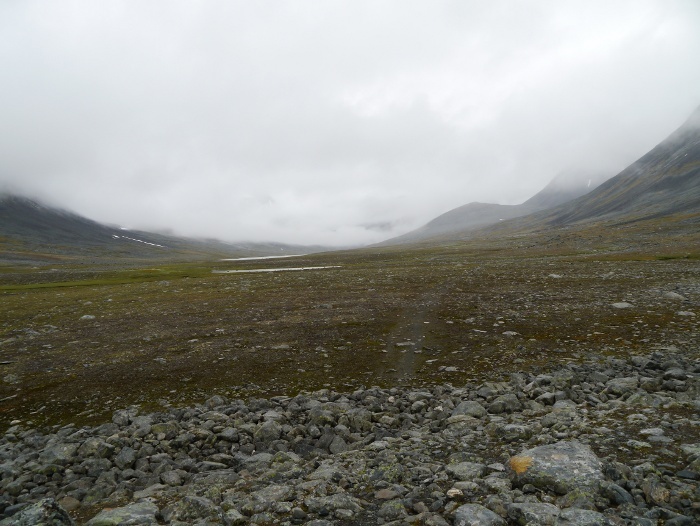 After days of spectacular walking Nikkaluokta was a bit of an anti-climax, although I am not really sure what I was expecting. It certainly is not a destination in itself. It basically consists of a restaurant, a service building for campers and a large car park. I timed my arrival just as a tour bus was disgorging its passengers into the restaurant. I did not fancy hauling my carcass in there to join them. I walked to a shelter and sat down to prepare for a two hour wait for the bus, reading my kindle to pass the time. The weather began to close in even more, the rain falling heavier and the temperature dropping. 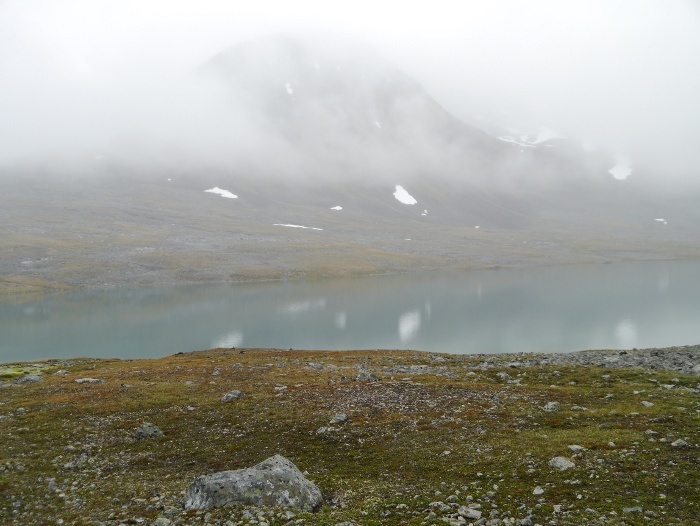 The surrounding hills eventually disappeared in the murk. 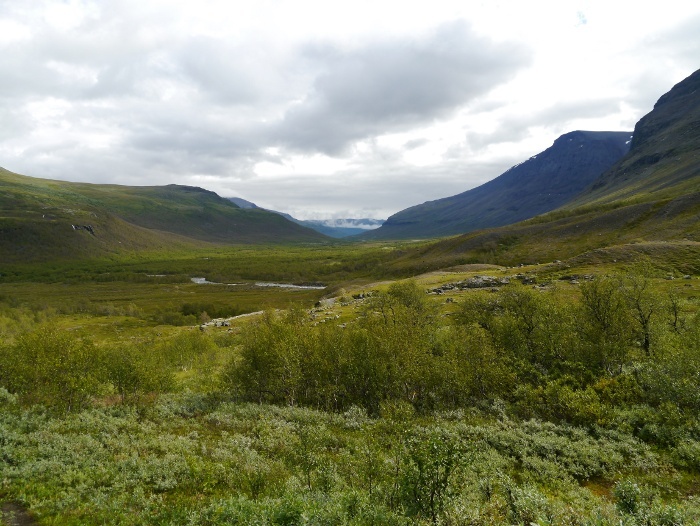 A small crowd had gathered by the time the bus came, whisking us through the forests of Lapland to the town of Kiruna. I had pre-booked a hotel a couple of months previously, securing a reasonable deal. I was glad to get into the warmth of my room, shower and put on the clean clothes I had saved for travelling. The following morning as I got a taxi to the airport the temperature had fallen to 1.5 celcius. Flakes of snow were falling amongst the heavy rain which had continued unabated through the night. 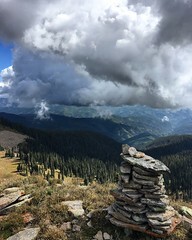 Weather wise I had timed my trek perfectly. As I lay snug in a cocoon of down I noticed that the sound of the rain hitting the flysheet had changed. The rain was somehow more solid and there was a distinct sliding sound. 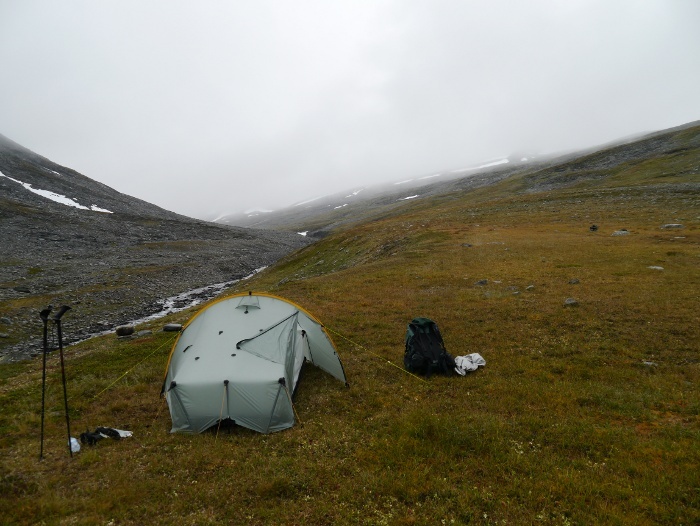 I unzipped my tent and stuck my head outside to be greeted by wet snow falling, curtains of white drifting across the valley. It was rather uninviting out there, the snow too wet to settle, my surroundings a cold soggy mess. I went back to sleep. An hour or so later the snow stopped and I forced myself out of my warm sleeping bag to face the chilly damp air. I sat for a while in my tent drinking coffee and eating bacon noodles, waiting for some enthusiasm to appear. I did not relish packing up and walking into the mist. My hands went numb as I took down the Scarp1, the wet material making it difficult to wrestle into its stuff sack. 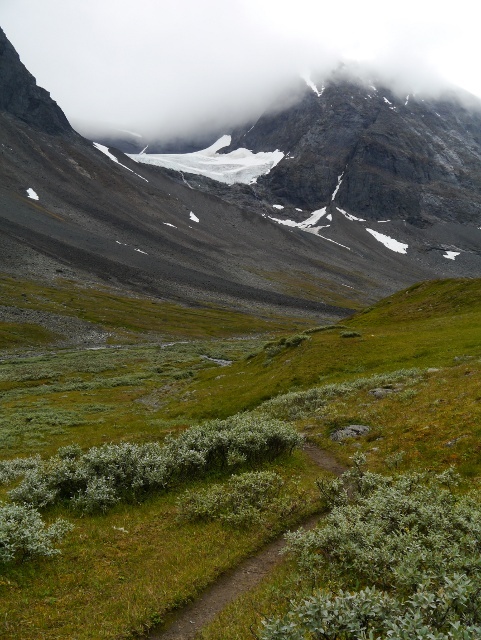 I cursed when I realised that I had packed my gloves along with my dry clothes at the bottom of my rucksack. 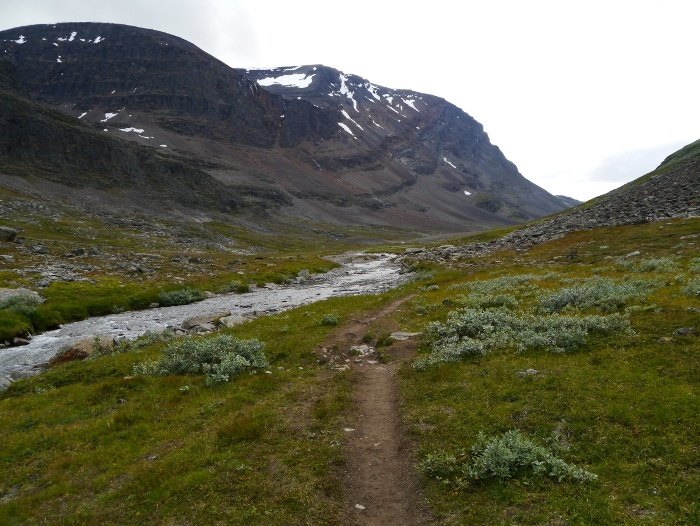 It was my fifth day on the trail without resupply so my pack weight had greatly reduced. This was appreciated when I set off up the hill, the river tumbling away to my left. 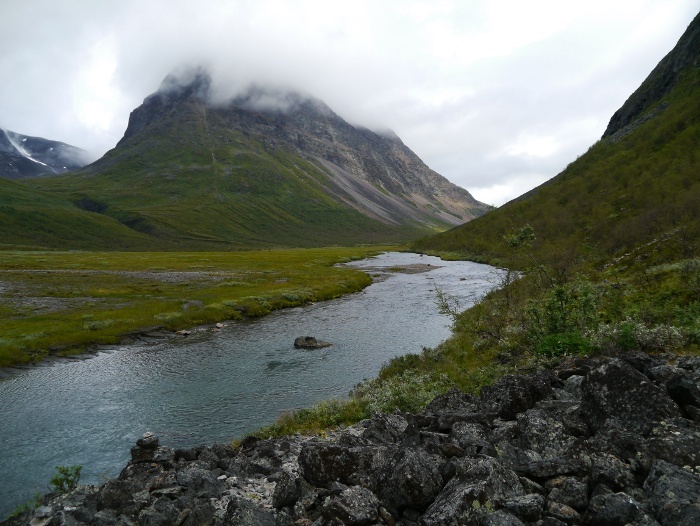 The surrounding peaks were firmly hidden under a thick blanket of cloud, mirroring the greys of the rocks below. 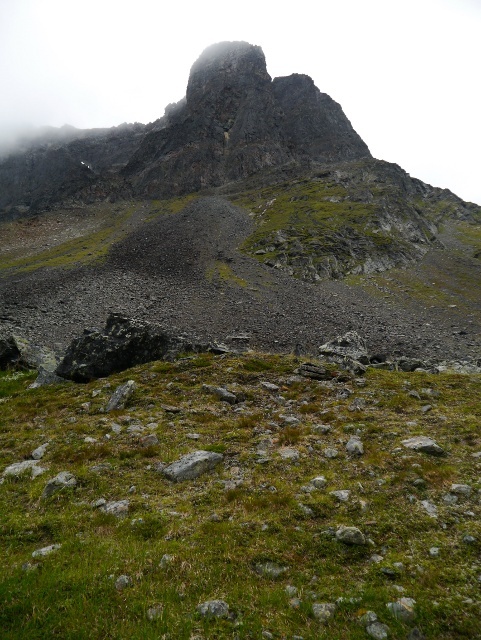 The Jagged peak of Nallu had disappeared, a feint outline of its grandeur was all that remained. 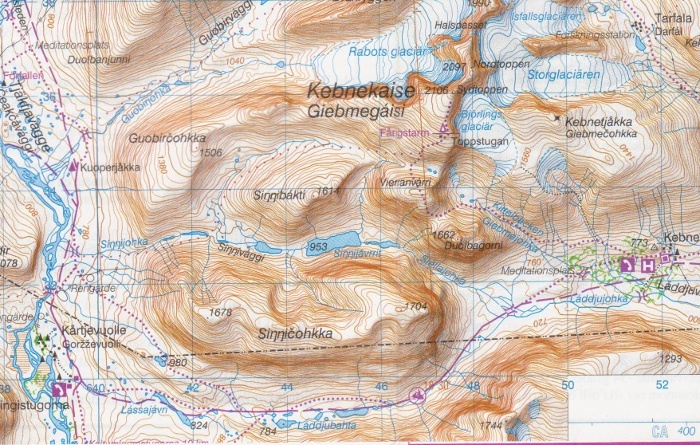 I wondered if the German lads would manage to get to its summit later in the day. I noticed that the cloud base was just skimming above the valley that I would be climbing into. Using a map with a scale of 1:100,000 I was worried about having to navigate in the mist. 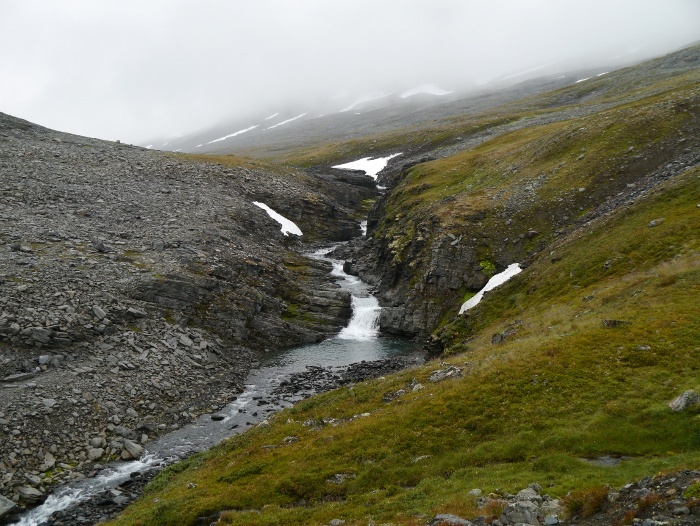 I made a mental note that the river should remain on my left until I got to the lake and then I would cross it. Climbing higher the terrain got rockier and the path less well-defined, although well placed cairns kept me on track. My heart skipped when I noticed movement on the hillside. 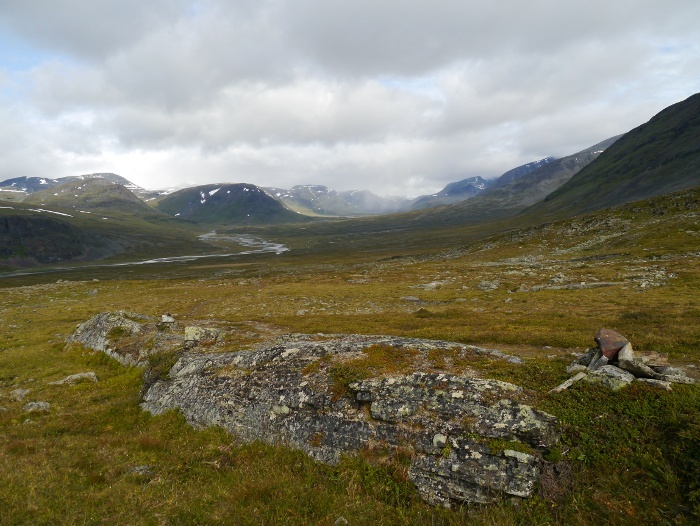 I was excited to see a small herd of reindeer grazing, amazingly well camouflaged against the browns and greys of the mountainside. So far on the trip I had been rather disappointed with their general absence. Maybe it is rather childish but in my head they really scream out ‘Lapland’ to me. I tried to creep a bit closer to get a good photo of them, unfortunately this immediately resulted in them legging it as fast as they could. The encounter had really made my day, apart from a squirrel they were the first bit of wildlife that I had spotted on the trek. With a bit of a spring in my step I continued to the head of the lake. I stood for a while and admired the sullen atmosphere of the place, swirling clouds teasing me with glimpses of the mountains above. Atmospheric it most certainly was but I have to admit I was bitterly disappointed with the lack of views. 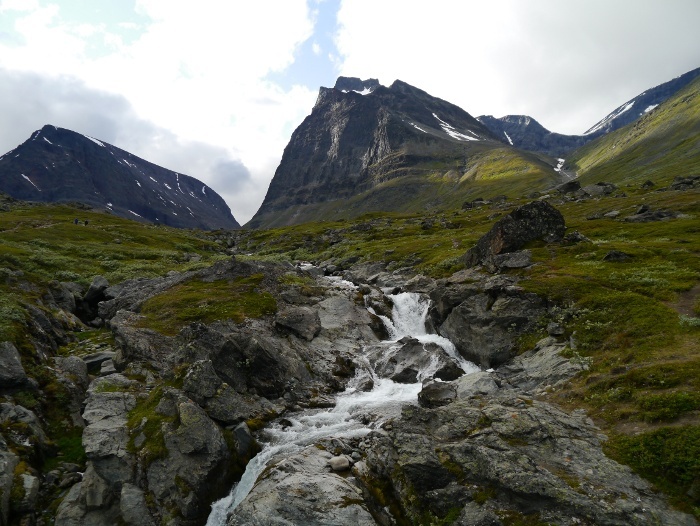 I had been looking forward to a day surrounded by huge peaks and tumbling glaciers. 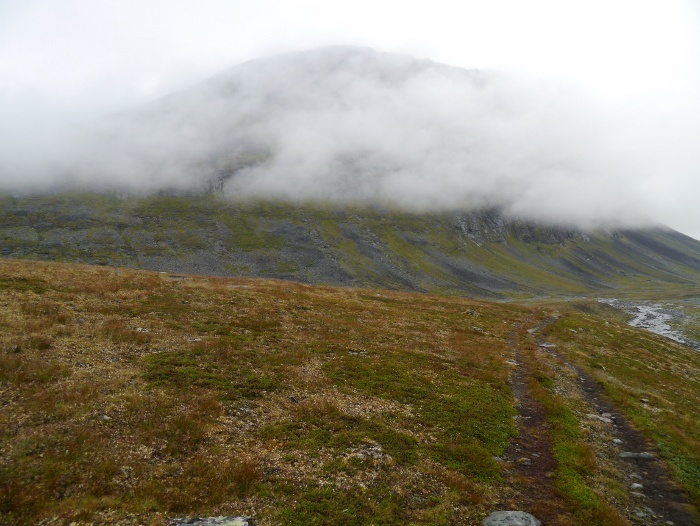 I was now at the highest part of the trek at 1056 metres on the shores of Reaiddajavri. Walking along the shore there was a final tiny cairn and then the path disappeared. I continued for a few hundred metres trying to relocate it but to no avail. I finally got the map out to check if I was too close to the shore line. It turned out that I was completely on the wrong side of the lake. I had stupidly forgotten to cross the river as mentioned earlier. It was a bit of a dilemma, should I turn around and backtrack or continue ahead and hope for the best? I continued ahead. 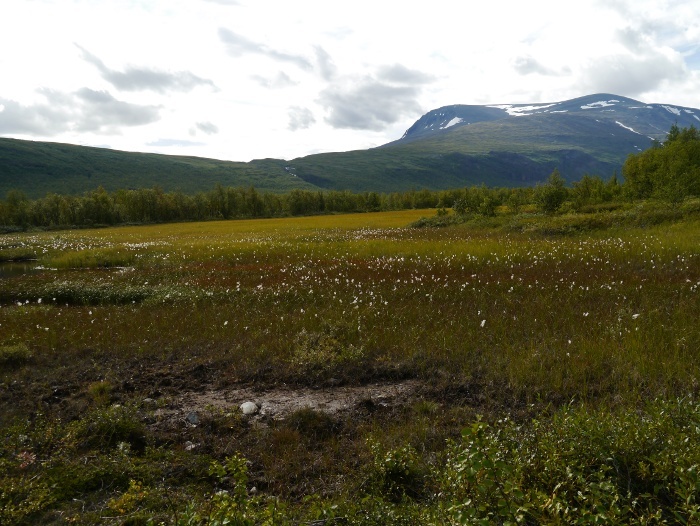 It turned out to be a bit of a boggy morass, the ground covered in standing water. A roar of a stream up ahead made me a little nervous as according to the map I would have to cross it at the end of the lake. 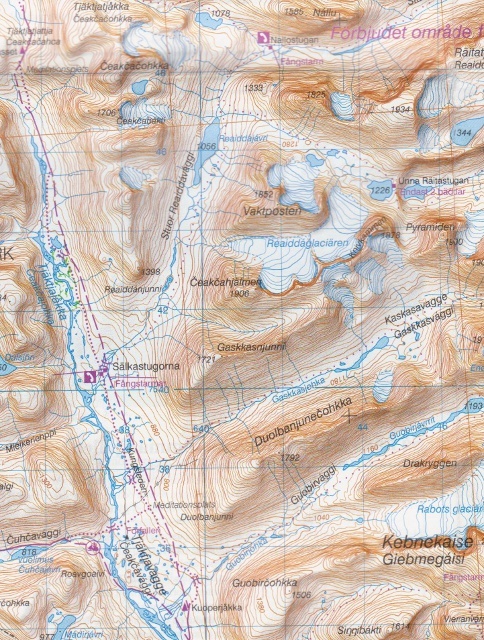 Thankfully the stream and the lake were separated by an area of high rocky ground, a slight inaccuracy on the map. 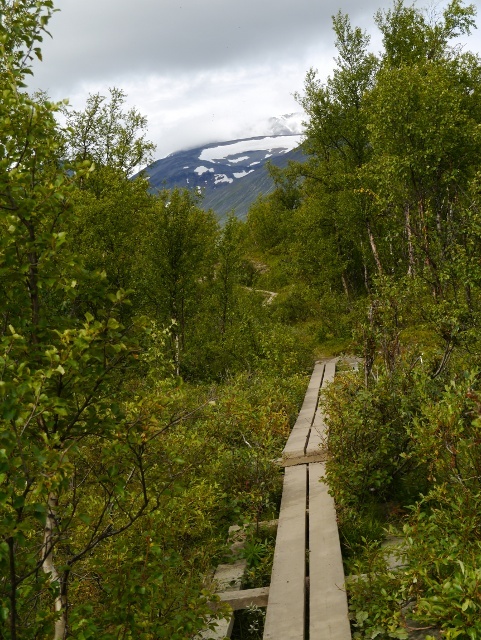 A couple of hundred metres of walking across slippery boulders got me back on track and I located the trail. I crossed a fantastic moonscape of grey rock, the going slow to avoid twisting an ankle. An unforgiving and bleak landscape, slowly revealing itself from the banks of cloud. The terrain soon turned grassier, a noisy river cutting through the landscape reinforcing the fact that I was actually now going downhill. 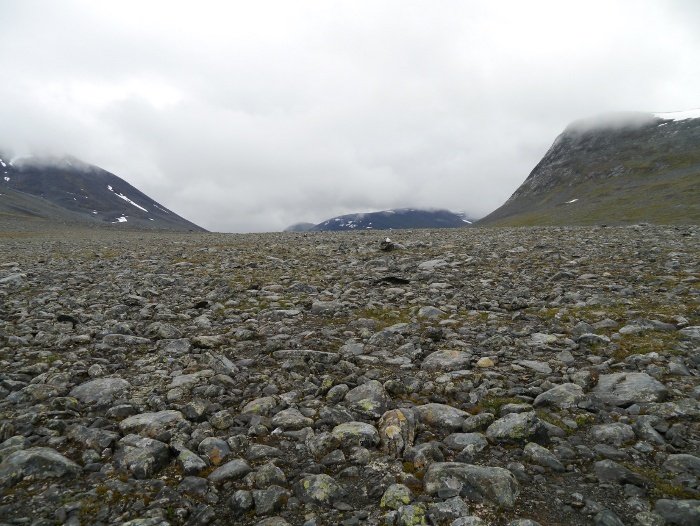 Such is the scale of the place it still felt that I was on a vast open plateau. 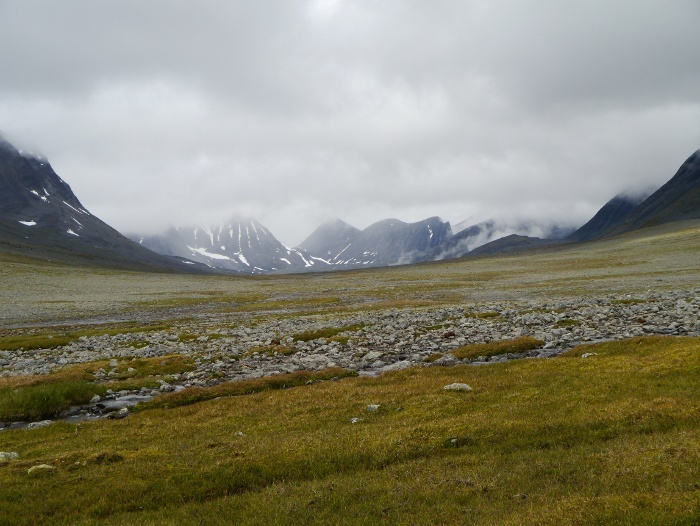 The weather was quickly turning for the better, jagged peaks including Nallu finally revealing themselves. A boulder next to a side stream provided somewhere to sit whilst I made a brew and cooked couscous for lunch. Although getting brighter there was still a chill in the air and I pulled on a synthetic hooded jacket over my waterproof. I sat filling my belly with warmth and watched the landscape shift and change in front of my eyes. Magical. After the hard rocks under foot it was good to walk across soft yielding grass and my pace quickened accordingly. Once again the landscape was changing and I felt that I was finally leaving the jagged spires of Lord of the Rings country. 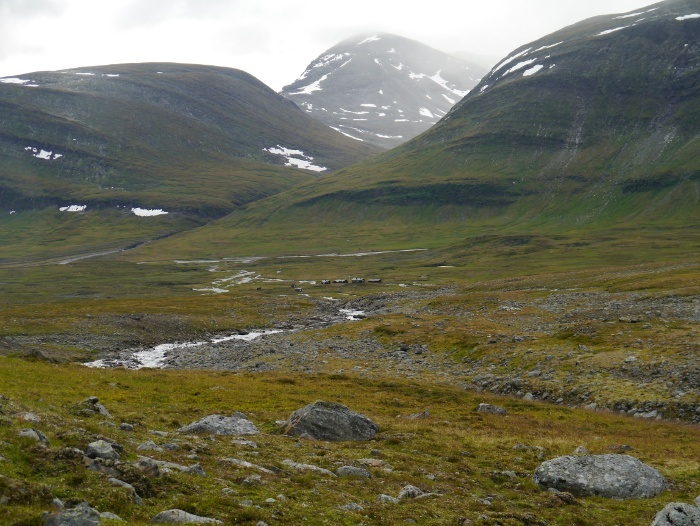 The soft sweeping curved forms appearing in front of me had the character of parts of the Scottish Highlands. Three days previous I had felt that I was walking through the Cairngorms on Steroids, here I could have been in a beefed up Northern Highlands. 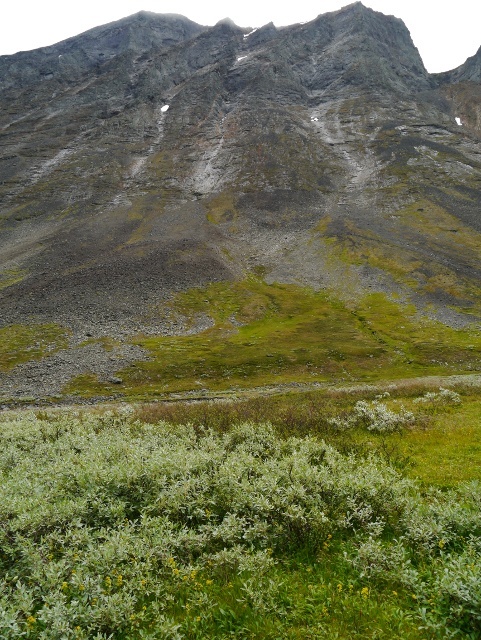 The peaks were speckled in white, not glaciers but patches of snow that had remained right until the end of the summer. My planned destination for the day came into view, the scattered huts of STF Salka completely dwarfed by towering peaks. 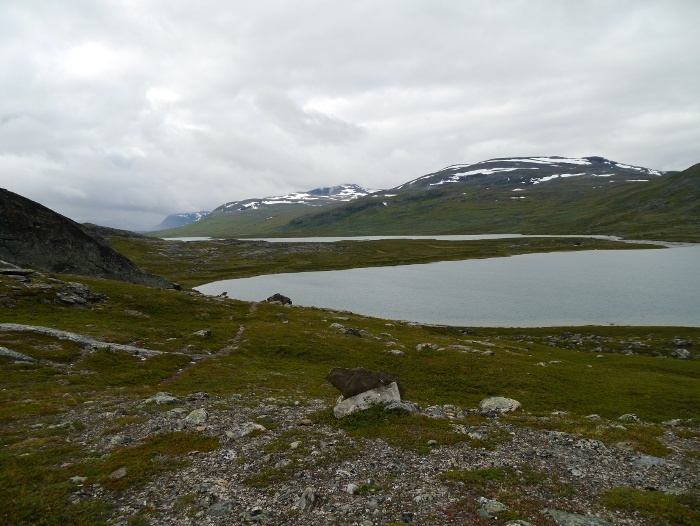 On the descent to the huts I stopped and chatted to a Finnish man heading the way I had come. He was carrying the biggest pack that I have ever seen, it must have towered a metre above his head. I could not resist making a comment about it and he proudly told me that it had weighed twenty seven kilos when he had set off. I hope that he had a couple of weeks food otherwise I can’t for the life of me imagine what he was carrying! 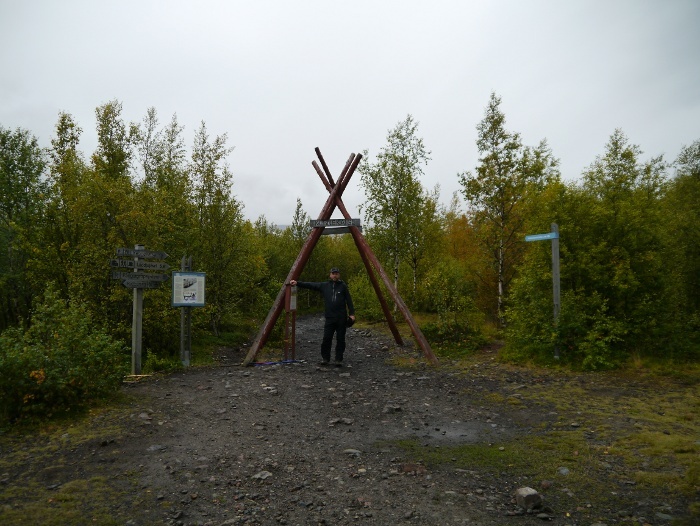 I had planned to stay the night at the Salka huts, either camping outside or getting a bed for the night. However it was much too early and my antisocial tendencies were beginning to kick in once again. I have to say that the thought of a sauna in the evening was rather tempting though. 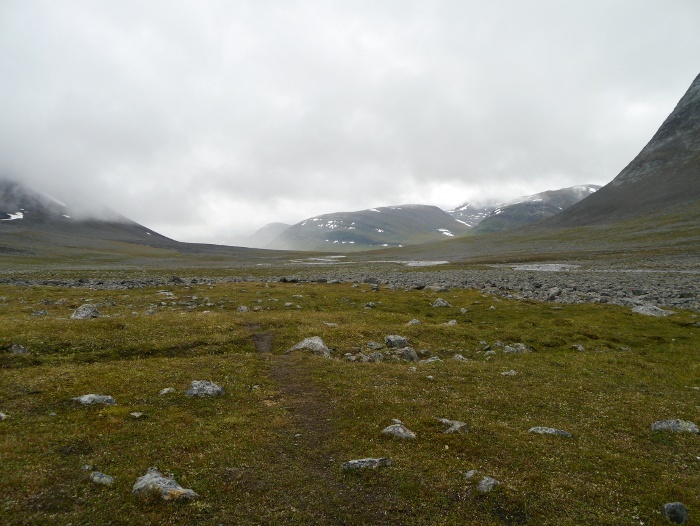 I left my pack outside the wardens hut and went inside to pick up a few supplies from the small shop. The warden was exceptionally helpful and friendly and welcomed me with a glass of juice. 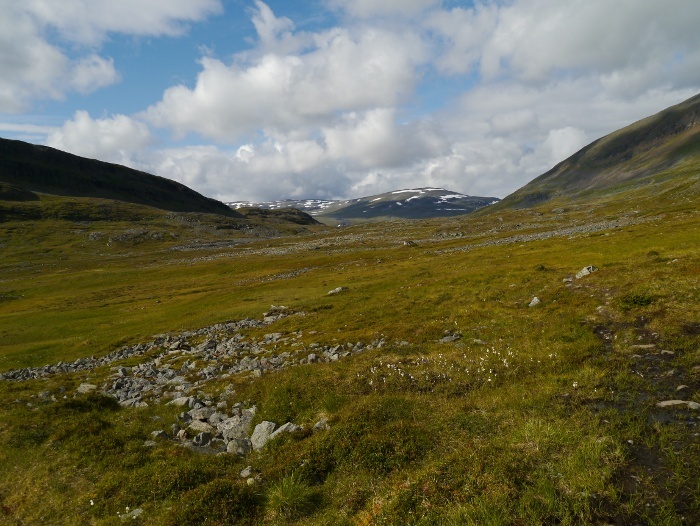 I brought a couple of packs of noodles and biscuits, the cost of which reflected both Sweden and the fact I was a major yomp away from the nearest road. 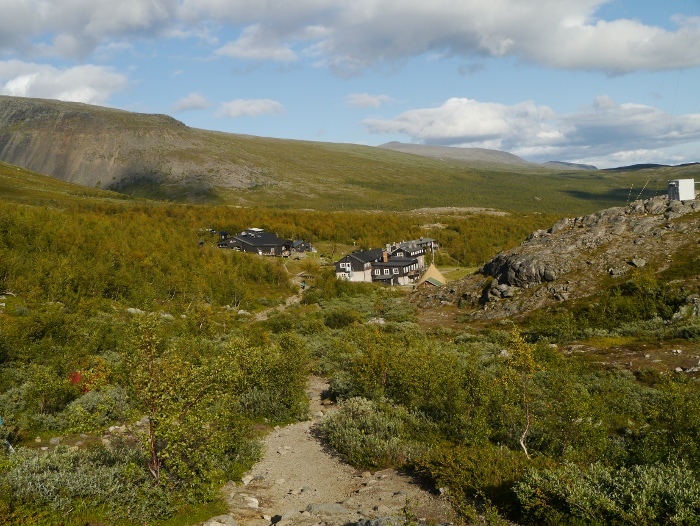 The area around the group of huts was a hive of activity, people arriving after a day in the hills. 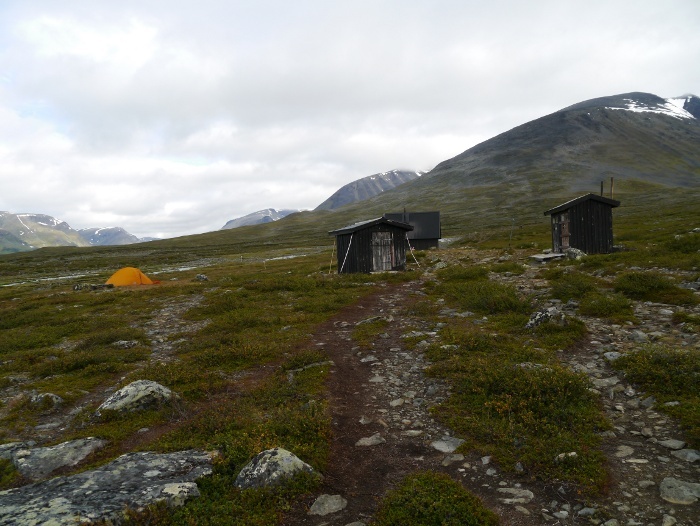 In UK bothies there are often comments left in the bothy book about the Swedish netball team paying a visit, relying on the stereotype about beautiful Swedish women. My short time at Salka hut simply reinforced that stereotype. 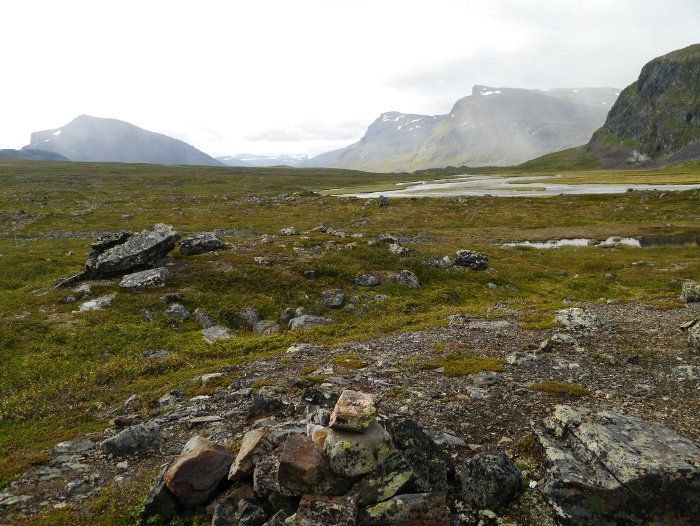 The warden let me deposit my rubbish before setting off, an effective system as I had not spotted a single piece of litter during the whole of the five days. 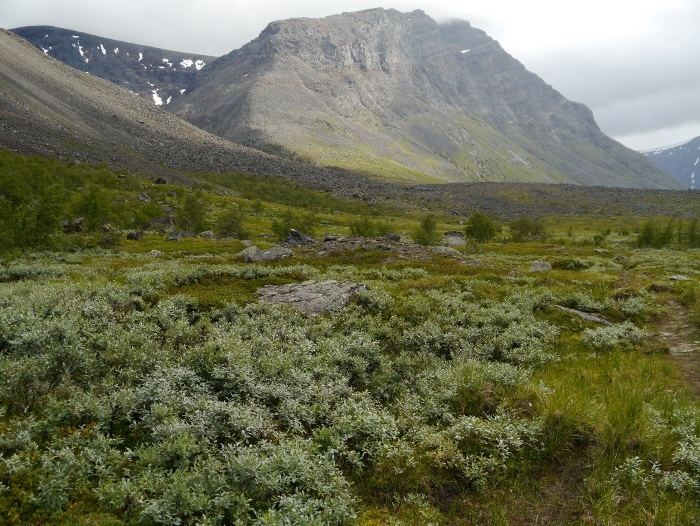 I had enquired about good places to camp further down the valley, aware that the vegetation at the lower altitude had become much more shrub like. I therefore set off with purpose, keen to bag a spot she had told me about. 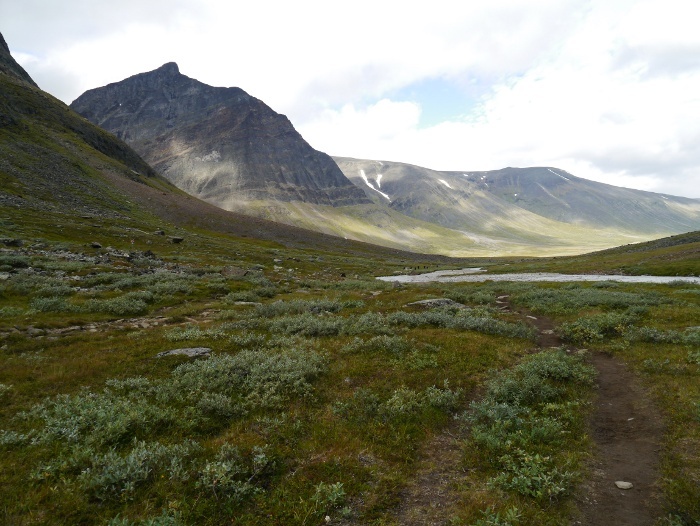 I was back on the Kungsleden again, the trail wide and easy to follow. 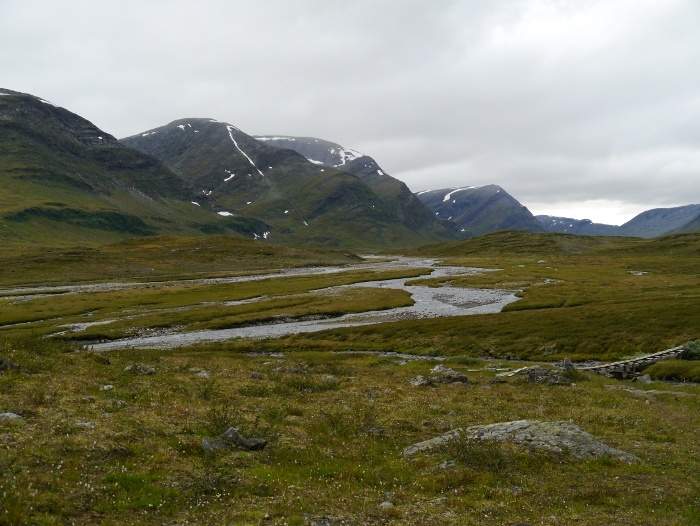 It was still fantastically scenic walking even though it was much busier than the previous days. 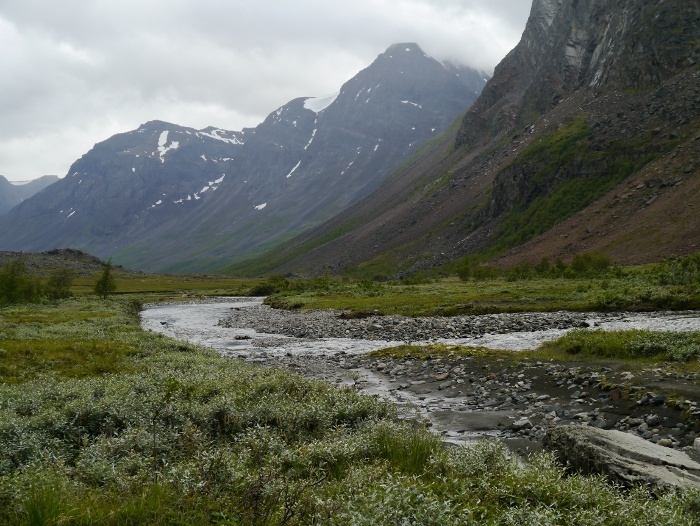 I stopped to look back at the view, mountains rising above a wide river valley. 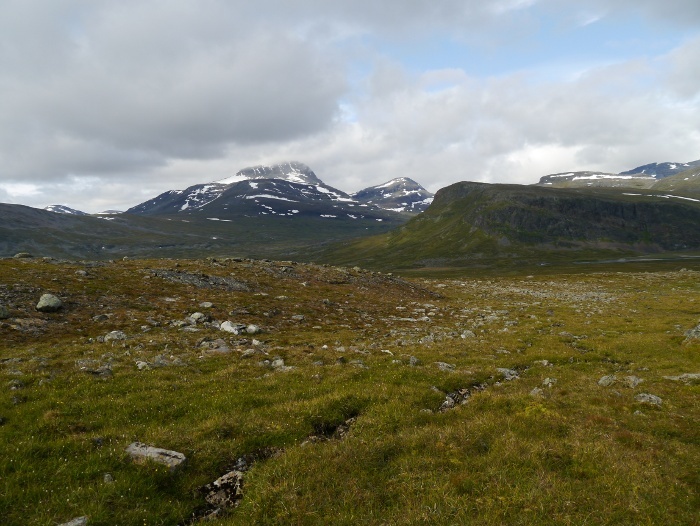 What struck me was the similarity of these mountains to Glencoe’s three sisters. All that was lacking was a piper playing in a litter strewn layby. I never am sure of the etiquette when someone stops you and starts speaking in a language you don’t understand. Is it polite to interrupt and say so or do you wait until they have finished? 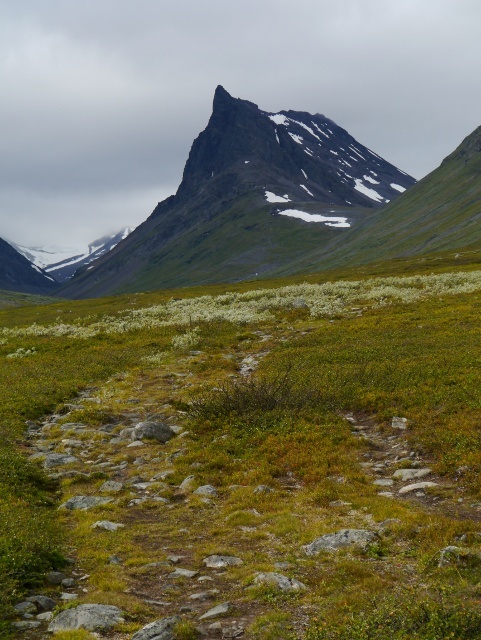 A couple were trying to work out the name of one of the impressive mountains, quickly switching to English after noticing the look of bewilderment on my face. A slow steady climb took me away from the river, curtains of rain once again gently sweeping across the hills from which I had walked. I had been lucky to escape the rain for much of the day. The promised campsite soon materialised, an oasis of proper grass amongst the prickly shrubs. I quickly got the Scarp1 up, getting inside just as a shower started. The shower soon passed and I got out in search of water. I walked down to a nearby thundering side stream and noticed that the water had a strange blue / grey tinge to it. 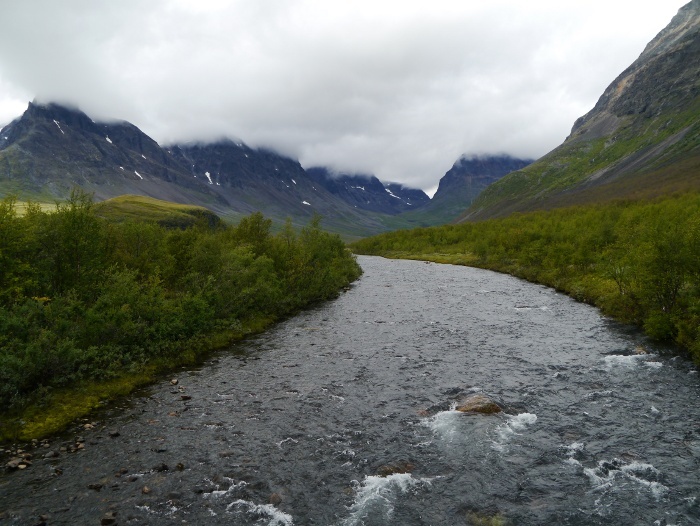 I could remember reading that water from a glacier can make you sick due to the sediments, so I decided to pass. 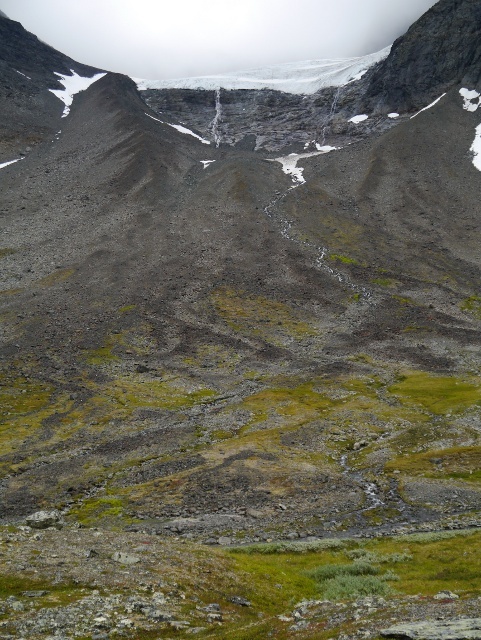 In the end I found a trickle a couple of metres from the tent, somehow I had missed it earlier. 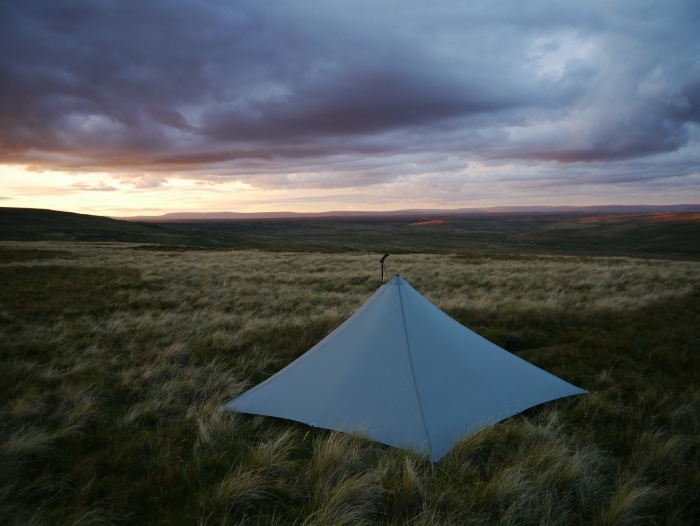 I spent another magical evening and night wild camping, the play of light on the surrounding hills keeping my attention until it was time to sleep. The evening temperature was cold, thankfully keeping the mosquitos as bay. The temperature had dropped close to freezing in the night and I was glad that I had brought my winter bag. 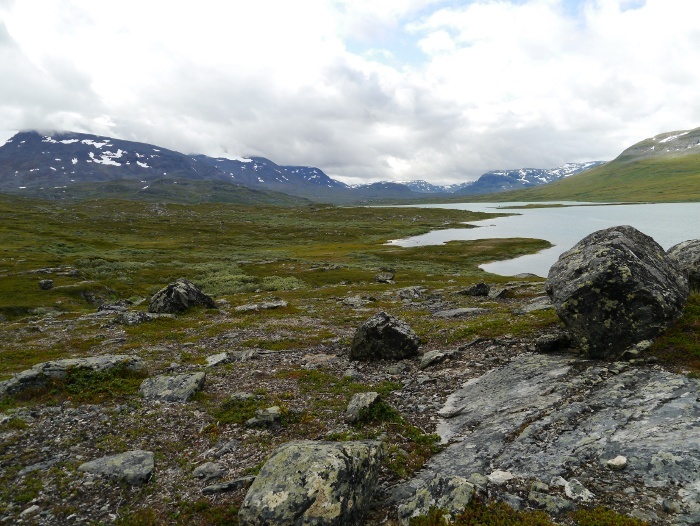 I was up and away early as I had decided that I wanted to get to the Kebnekaise mountain station by the end of the day. I was pretty keen on having a shower! 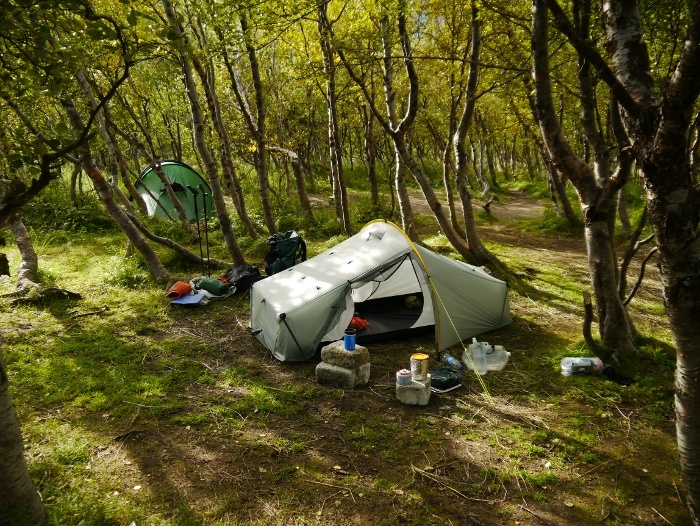 Within a few minutes walk I passed the unmanned hut at Kuoperjakka, with a couple of tents pitched outside. I looked through the window but it looked pretty grubby and uninviting, although I imagine I would have a different opinion in bad weather. It even came complete with an outside privy. Once again showers were tracking their way down the valley, but through luck I managed to avoid them. 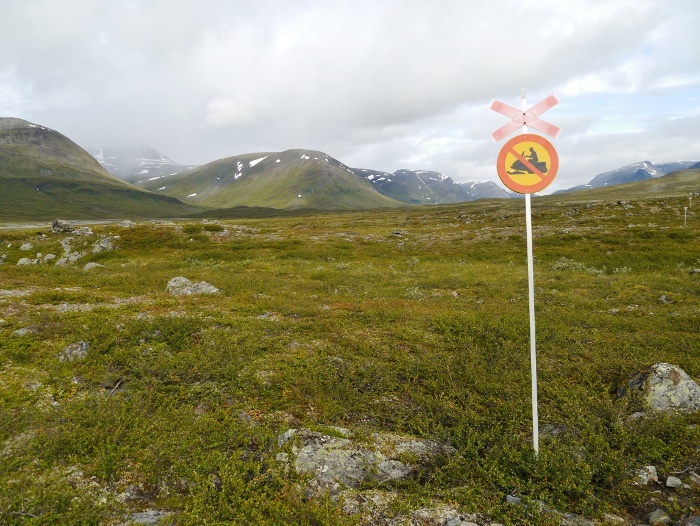 All along the Kungsleden there are poles with a red cross on the top, markers for the winter route. I think that the sign below is clear in its message. 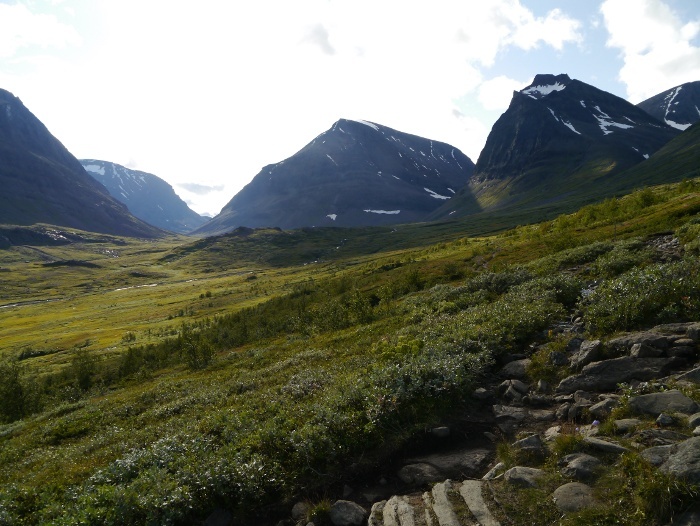 I soon left the Kungsleden once more to climb the shoulder of a hill on a popular shortcut towards Kebnekaise. 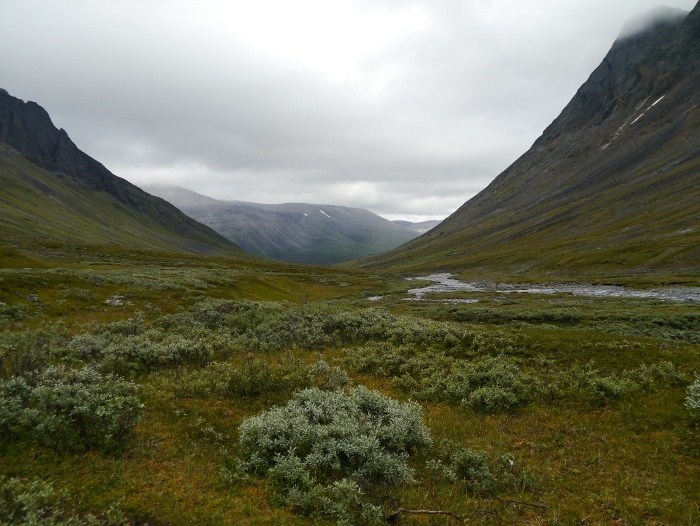 A final opportunity to look back the length of the immense valley I had walked through. 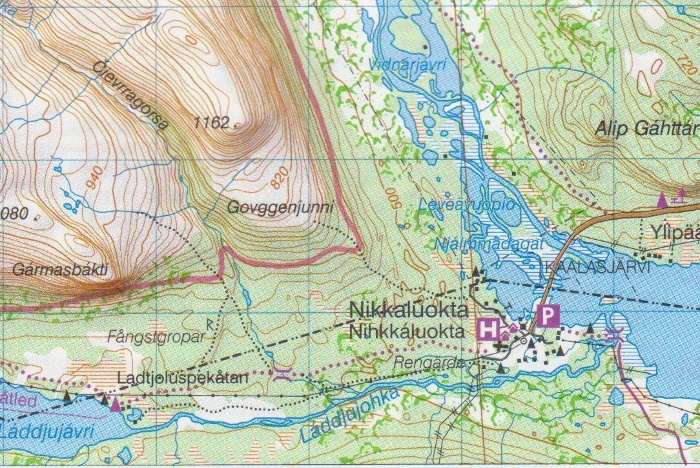 The path climbed steadily to a lake simply identified as 980 on the map, indicating its altitude. It was a busy spot, groups enjoying the sun, Trangia’s busy making brews and cooking lunch. 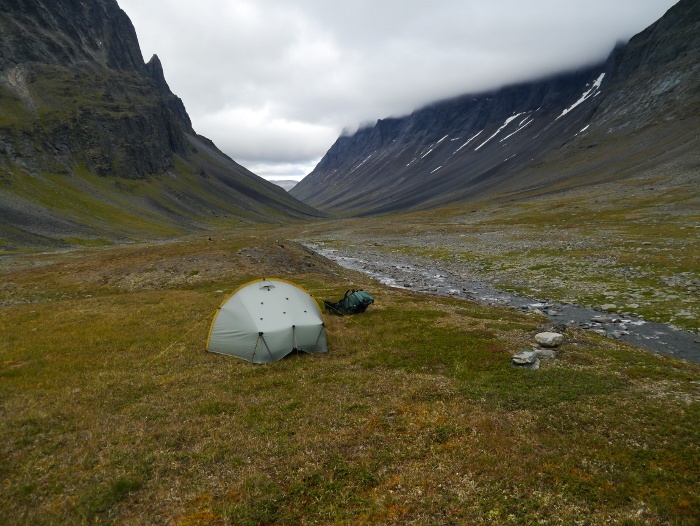 During planning I had decided to spend the night here and there were plenty of idyllic pitches. However if I got to the mountain station by evening I would be a day ahead of myself, making the final morning much more relaxed, time to ensure I would not miss the bus. 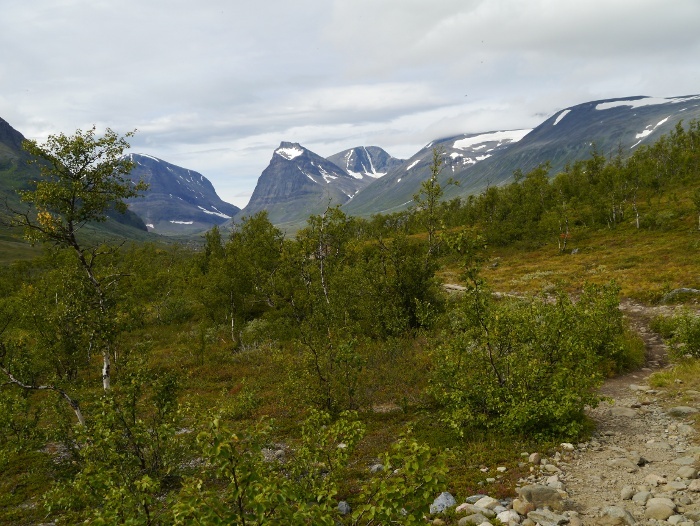 The route was pretty much all downhill now, however lower elevations would not mean the scenery became any less impressive. Soon after leaving the lake a huge pyramid of rock reared out of the valley ahead. Just off my map I have no idea of its real size and I have the feeling it was the end of a much bigger mountain. All I can say is that it was immense. 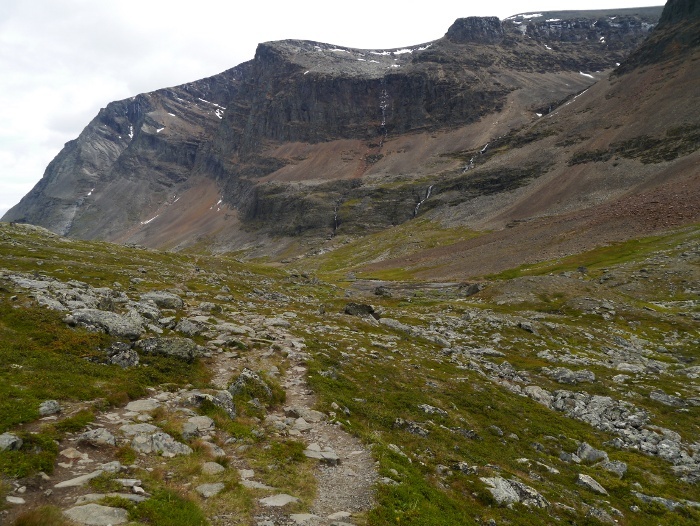 The path down to the head of the valley was steep, a shock to the knees after the generally gentle ascents and descents of the past few days. I found a boulder to perch behind and got my faithful Jetboil out once again to make a brew and cook lunch. A routine I am keen to continue when backpacking in the UK. Hot food is appreciated for lunch and it gives you time to just sit and appreciate your surroundings. Heading down the valley I was once again confronted by another wall of rock, thin slivers of water cutting across its surface. The path was rocky and it’s difficult to walk and stare in amazement without tripping over. The valley finally opened out, impressive peaks to my left giving a taste of the panorama to come. The views back to the peak of Duolbagorni were spellbinding, one that would remain on the horizon for the next twenty plus kilometres. 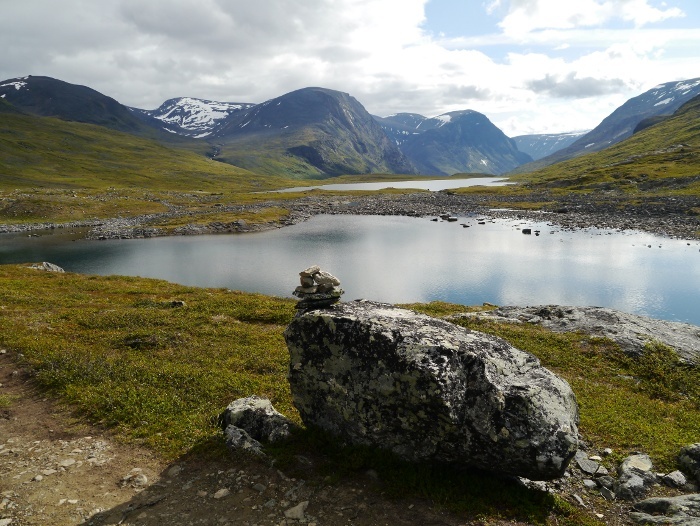 It’s a foothill of Kebnekaise, bypassed by the popular path to the summit of the highest peak in Sweden. 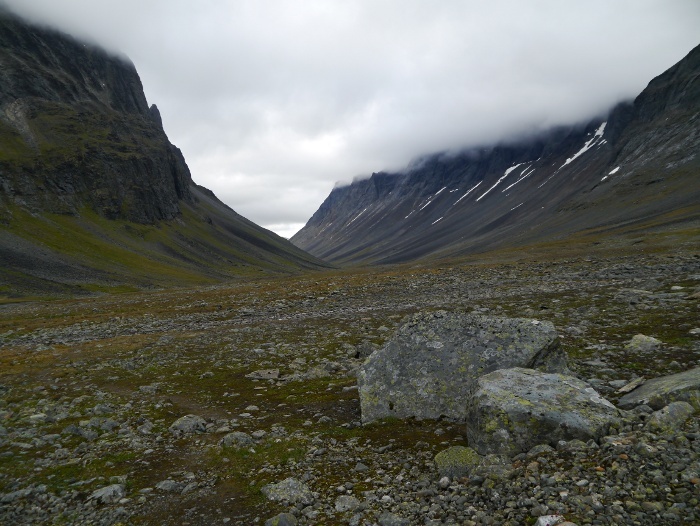 Kebnekaise itself is well hidden but the jagged fangs of Duolbagorni is the star attraction in many of the views of this area. 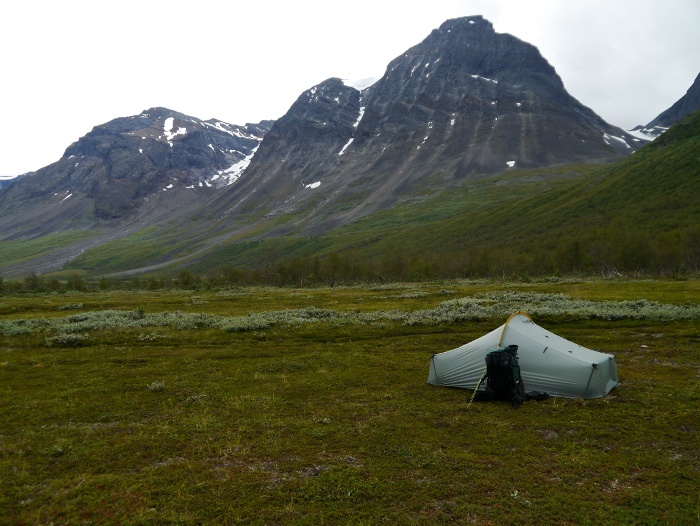 Close to the Kebnekaise mountain station I started noticing tents dotted around the hillside, occupying just about any bit of flat ground. I planned to stay in their campsite so continued past many idyllic looking spots. The afternoon weather at this slightly lower elevation was hot and sunny, very welcome after the mist and cloud of the previous couple of days. Cresting a rise the mountain station lay ahead of me, a strange sight considering that it is located nineteen kilometres from the road head. I wandered down to the busy reception building, a complete culture shock after six days walking on my own. There was a sign stating that the place was fully booked as I approached the desk. I was glad that I was camping. I enquired about the campsite and was told that there was none. 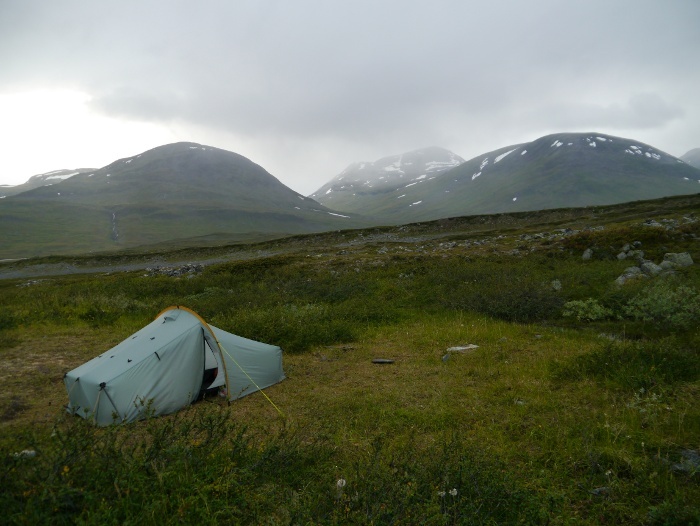 However I could camp for free as long as I was more than 150 metres from a building. The caveat was the 300 SEK (£30) service charge if I wanted to use the toilets or showers. Yep you read that right. 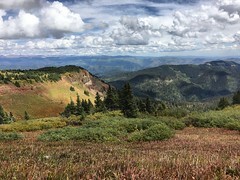 I was hot and tired and could not face a walk to find a good wild pitch so paid up and headed into an area I was told would have some camping spots. 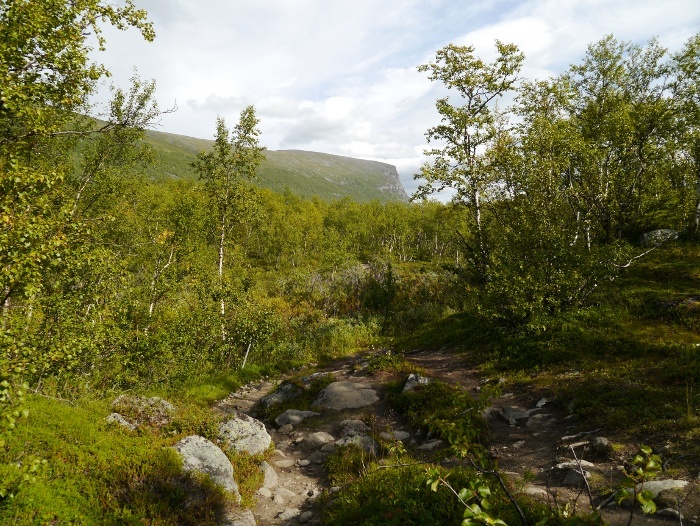 I managed to find a spot of bare earth which was almost passable within the nearby birch forest. It was a busy spot full of disappointed campers who had failed to get a proper bed for the night. It was great to shower and feel clean once more, unfortunately soured a little by the fact it had cost me £30. What peeved me was the fact that no one asked to see my pass in the service building, I could have sneaked in for nothing. I then managed to spend £20 on some couscous, biscuits and a can of pop. 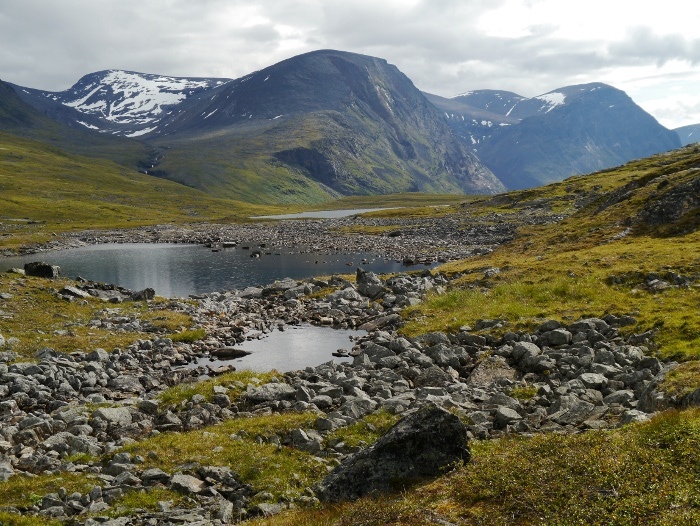 Please please if you come this way give the Kebnekaise mountain station a wide berth unless you have very deep pockets and enjoy a busy wilderness experience. The evening soon got cold and I read for a while in my tent, disturbed by the group of lads in the tent next to me. It was not the fact that they were loud, it was just that one of them had the worlds most annoying voice. I vowed that the next night would be spent in an idyllic location. 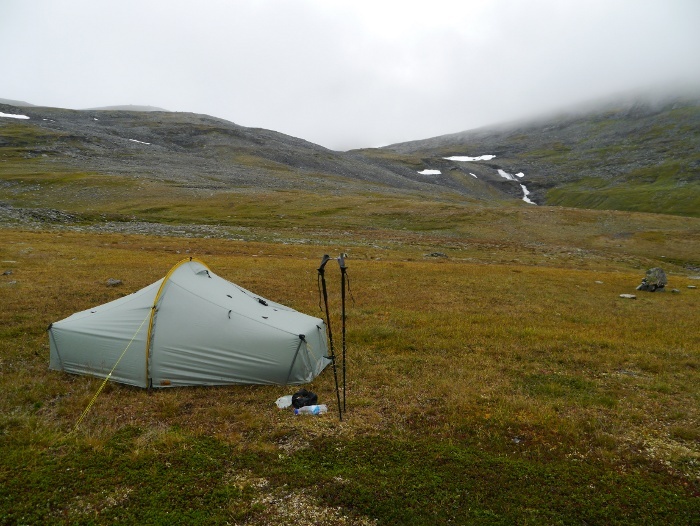 I woke to the dispiriting sound of rain falling on my tent flysheet. It was obvious that the blue skies of the previous evening had disappeared. 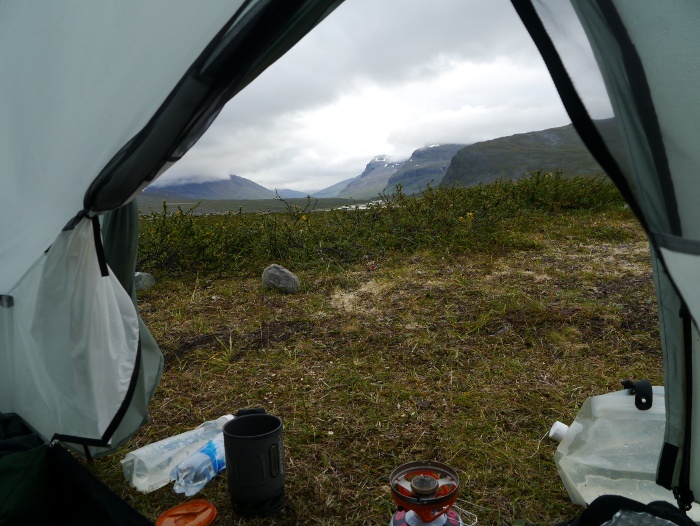 There is only one thing you can do when you wake to rain whilst wild camping, turn over and go back to sleep. An hour later there was still the pitter patter sound and I stuck my head out of the tent. It was only a light drizzle falling, as usual the weather sounds much worse when you are cocooned in nylon. Low cloud was just beginning to dissipate from the high tops as I started to pack. 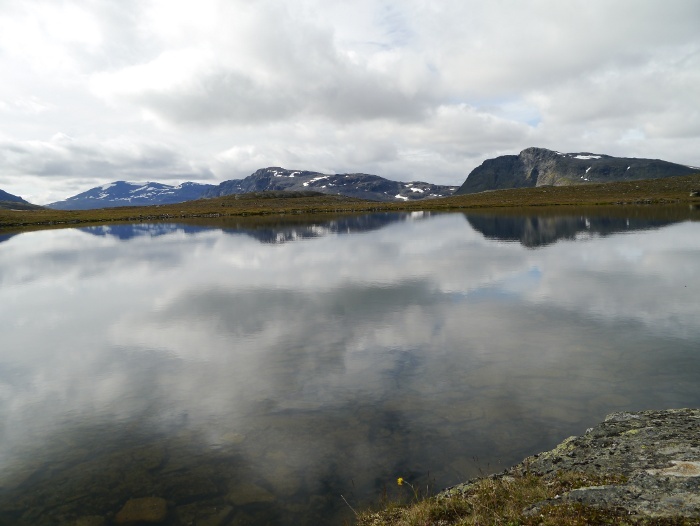 There was a distinct chill in the air, the temperature several degrees lower than the day before. 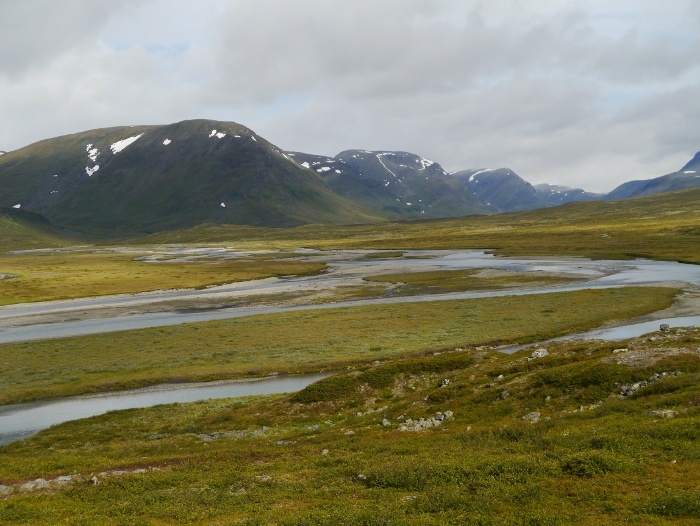 The landscape appeared bigger and less welcoming under a mantle of grey. 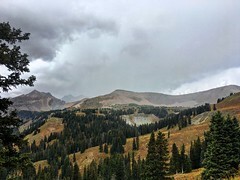 I set off along the narrow path hoping that the rain bands sweeping further up the valley would not come my way. Passing to the south of Njuikkostakbakti I got a different perspective of its giant black cliffs, a really impressive piece of mountain architecture. 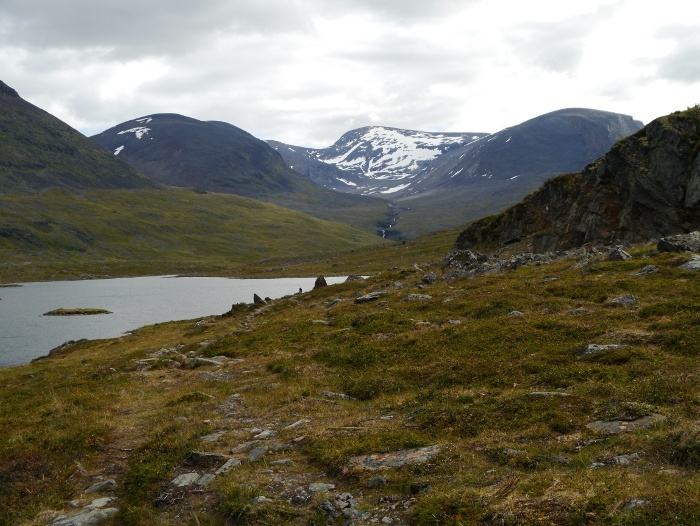 The path along the eastern shore of the long lake of Alisjavri was a joy to walk. Often it would only reveal itself a few metres ahead as it wound its way across the rough landscape. One minute it would pass through thickets of vegetation and boggy stream crossings, the next there would be rough boulder fields. 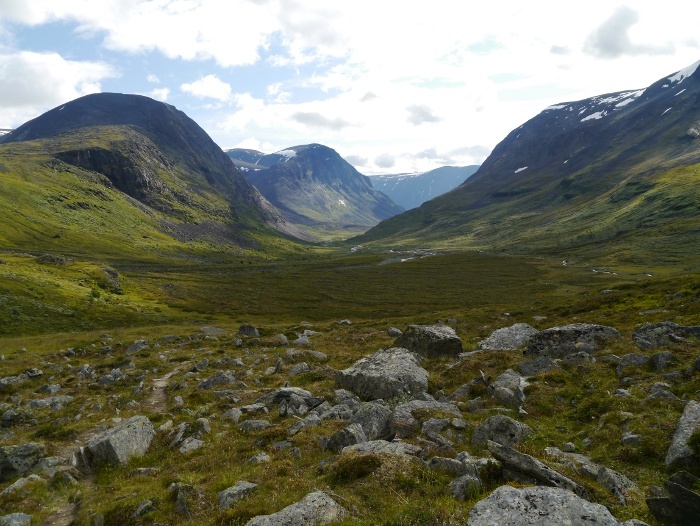 The scenery was simply outstanding, with parts of this walk having a Cairngorm like character. It was in part familiar yet at the same time completely alien. 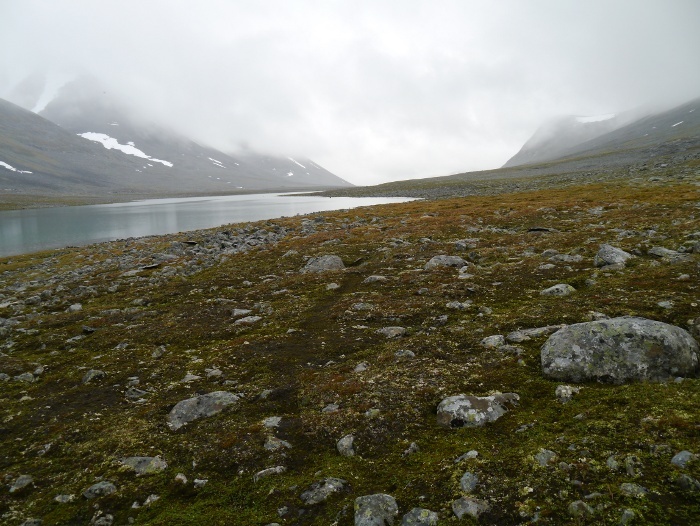 The scale of the place made it feel like you were not moving, it seemed to take an age to progress along the lake. Using a map with a scale of 1:100,000 did not help matters in this respect. On this side of the lake many fingers of land extend towards the water, making the shore appear much more complex than on the map. 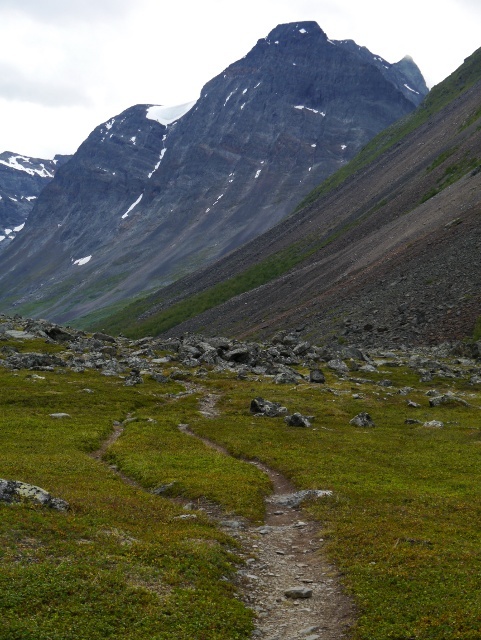 The path would constantly climb up and down in an attempt to keep on a fairly straight course. 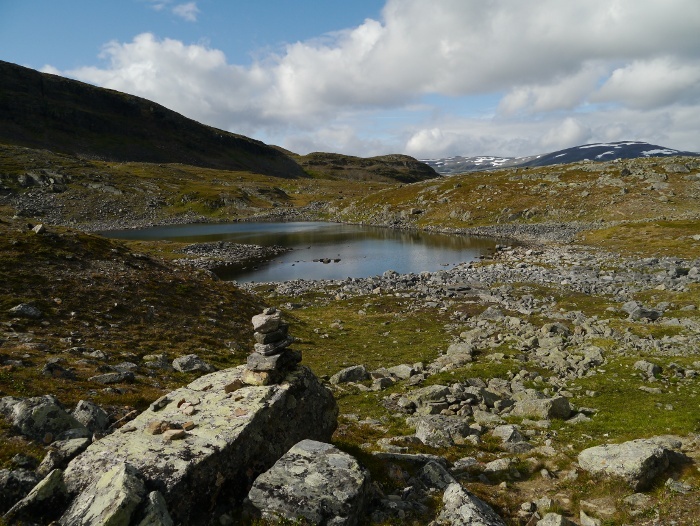 On one such rocky rise I caught my first glimpse of the STF huts at Alesjaure, right at the head of the lake. They were on my original route and would be buzzing with activity despite their remote location. 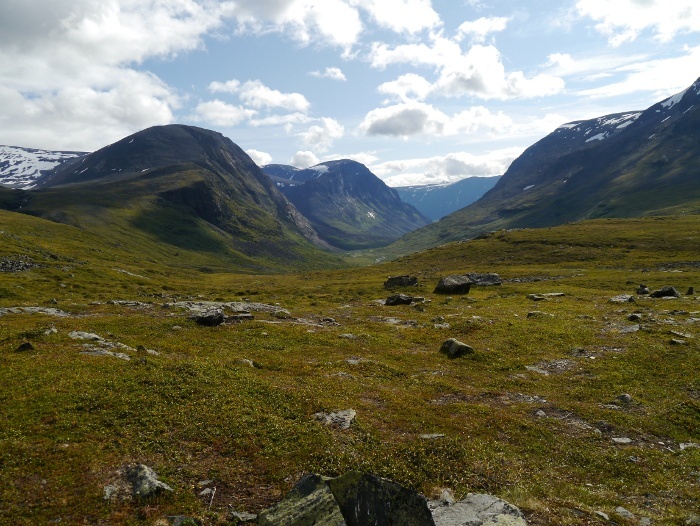 From where I stood they may as well have been a million miles away, this part of Swedish Lapland was all mine. 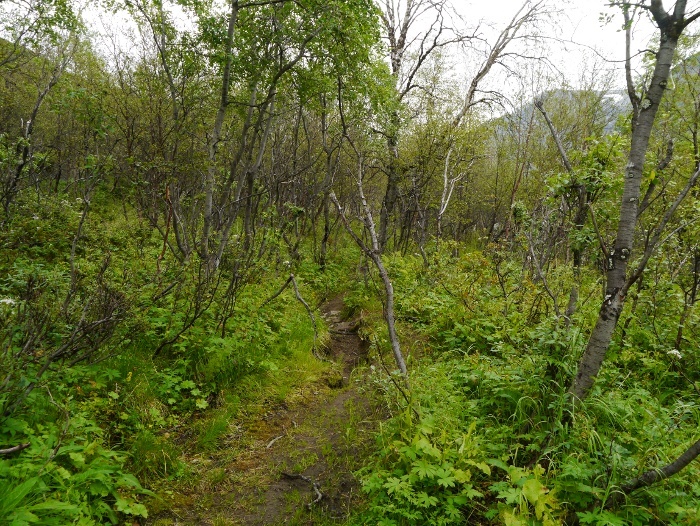 The path then vanished into a boggy section, failing to materialise on the other side. 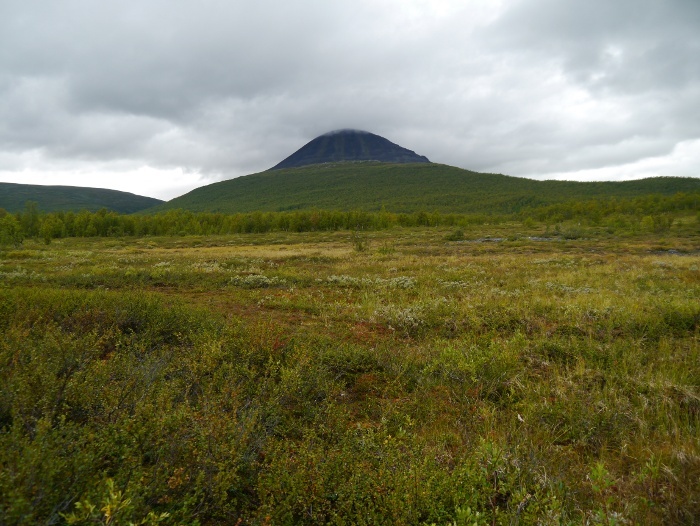 Thankfully the vegetation was short and progress was easy and I headed directly towards the Sami settlement of Alisjavri. 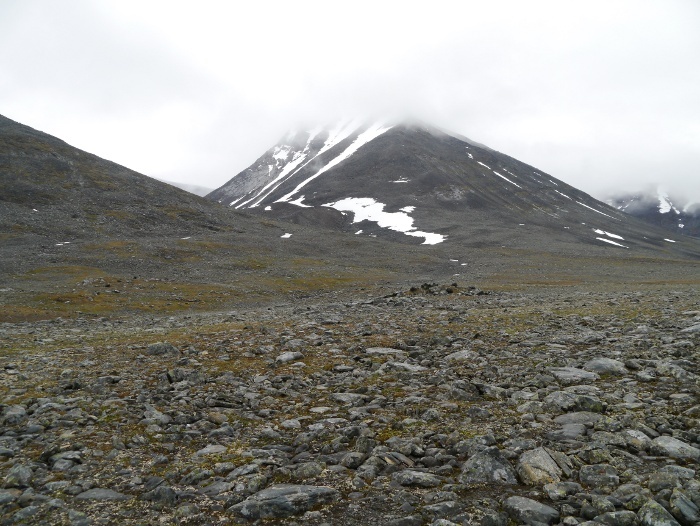 I passed the huge reindeer enclosure, the earth churned from countless hooves from when they are rounded up. 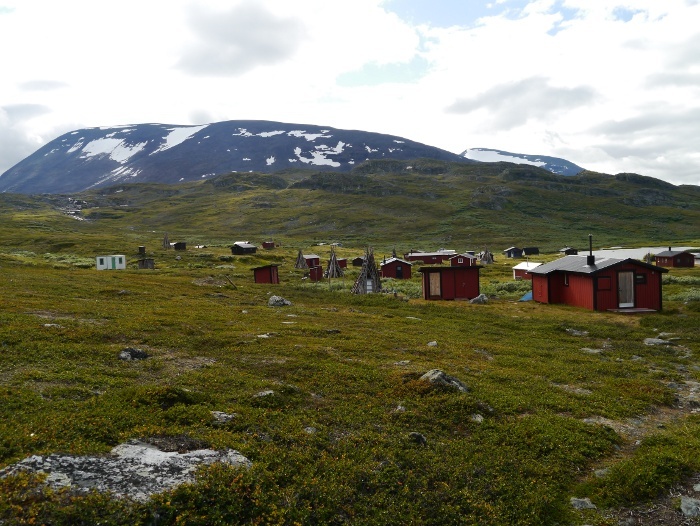 The settlement itself consisted of numerous wooden huts, complete with outhouse. It was eerily deserted, the huts locked and shuttered, just a feint scent of wood smoke in the air. 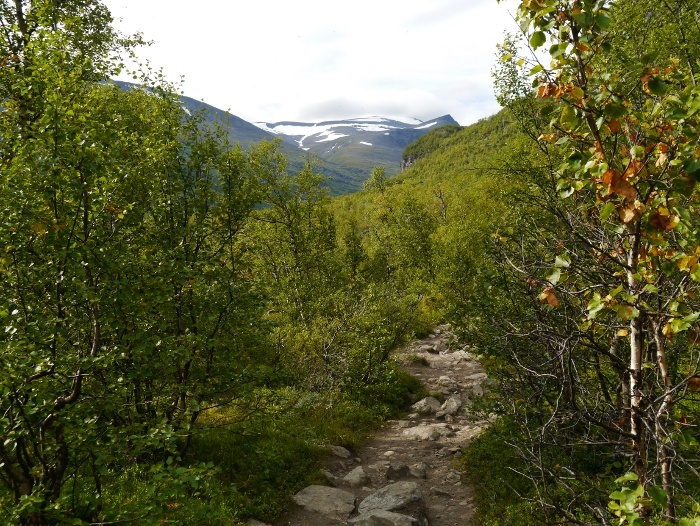 I walked through the settlement picking up a narrow path above the highest hut. 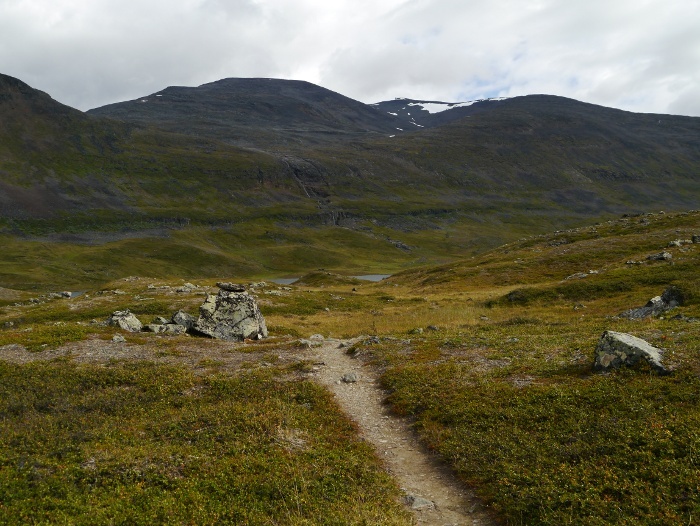 Once again the path provided easy walking as I slowly gained height, aiming for a lake nestled in a low pass through the mountains. The sun finally managed to put in an appearance, the temperature quickly rising. This initially lifted my spirits but had an unfortunate side effect. The mosquitos once again started to buzz around me and I was aware that they were starting to feast on me through my base layer. Although I was now dripping with sweat I pulled on my pertex windshirt which provided an effective barrier. The bites from the previous day were beginning to become sore and itchy and I did not want to add to them. Despite the buzzing in my ear I could not help lingering, the views to the south as I came around the corner demanding my attention. I passed the first people I had seen all day, three young lads sitting having a break in the sun. I tried to engage them in conversation (being British I chose the weather as a topic) but it was a bit of a non-starter. 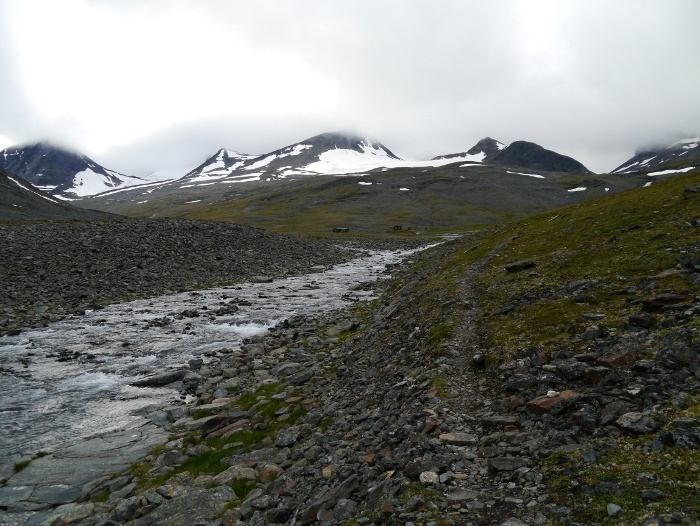 The ground became increasingly squelchy and the path less well defined. 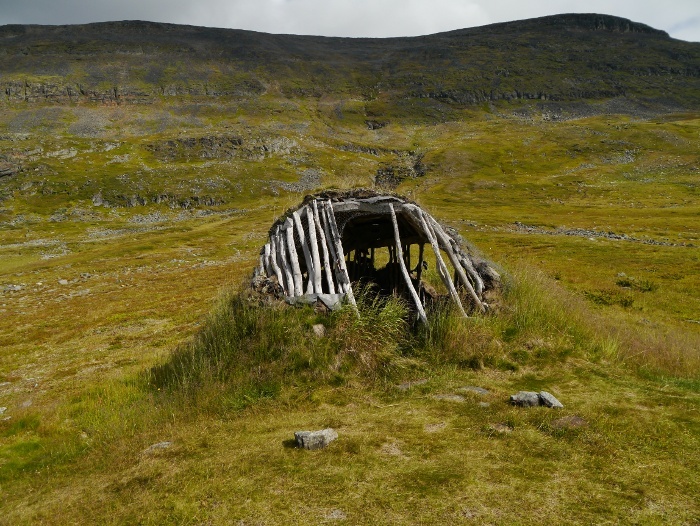 The shelter marked on my map turned out to be an old Sami hut which looked like it had seen better days. Still, I bet on a wet and windy day it would provide a welcome lunch spot. 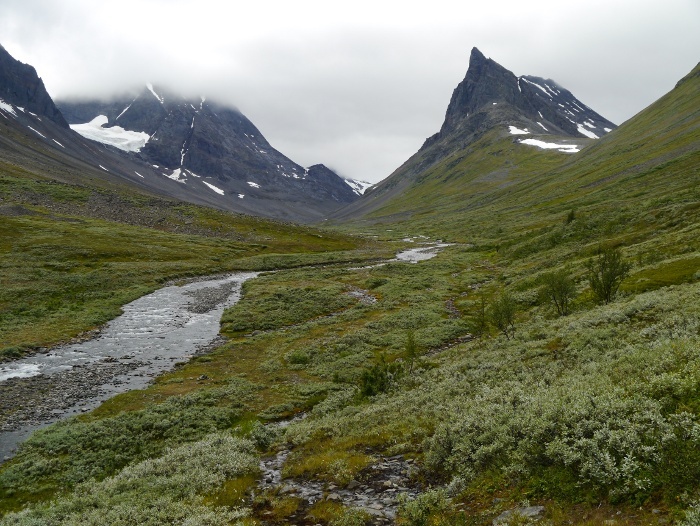 The ground started to drop away slowly, the long empty valley of Visttasvaggi beginning to reveal itself, enclosed by towering peaks. It was another stunning scene, the scale of which I have totally failed to capture in a photograph. For that I highly recommend you walk to and stand at the head of the valley. You will not be disappointed! Just before the last steep descent into Visttasvaggi I passed another group of young people who really did not appear to be enjoying themselves. Two of them were dressed in jeans and what could only be described as skater shoes, canvas with a flat sole. Out of the four only one returned my greeting. 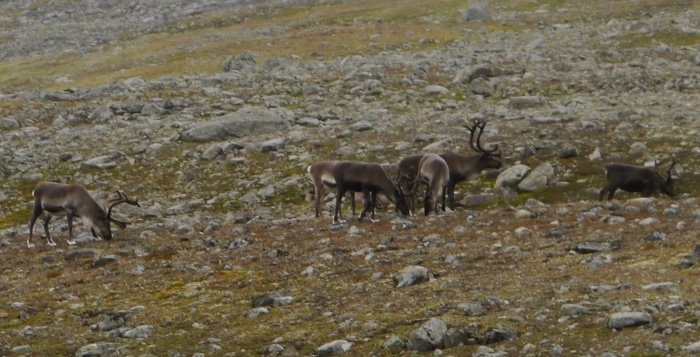 They were a bit of a strange sight in the middle of Swedish Lapland, nearly three days from a road. I could hear the water long before I could see it, the path doubling back on itself, finally revealing a hidden gorge which is crossed by a suspension bridge. 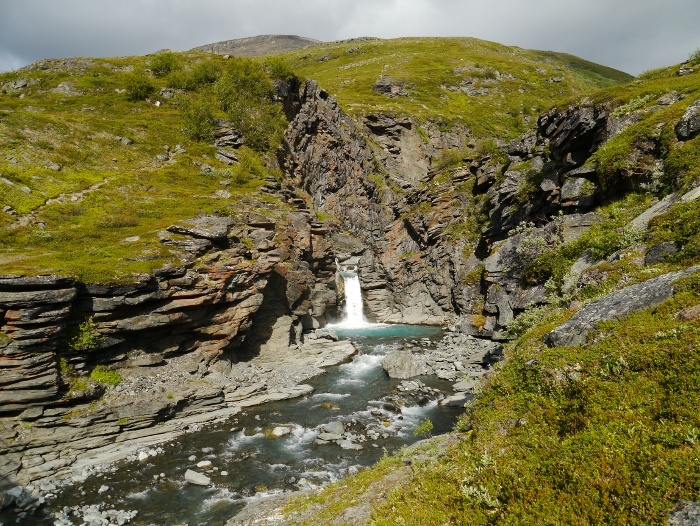 A waterfall plunged into a deep blue pool, clear water then carving its way through the rocky depths. I scrambled down towards the water, finding a comfy perch where I could make coffee and cook couscous for lunch. I took off my shoes and socks and dipped my toes into the river. Toes were as far it got, the water was simply too cold to put my whole foot in. Ten minutes later the three lads who I had passed earlier crossed the bridge and came and sat down right next to me. What was really odd was the fact that they still managed to shrug off my attempts at conversation. 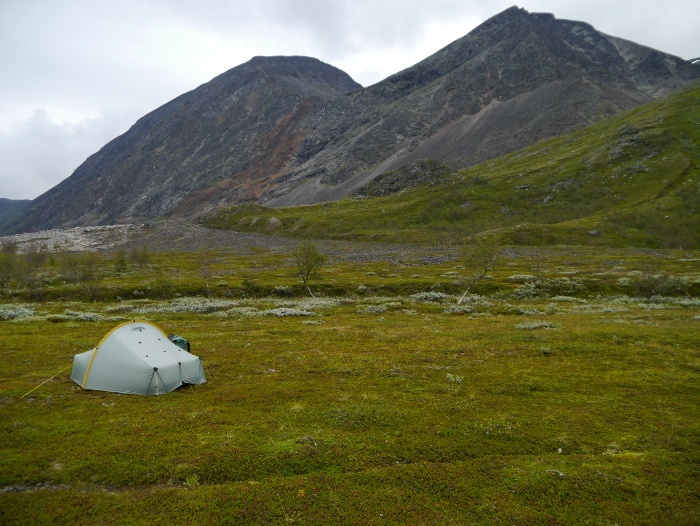 They proceeded to get a huge Trangia stove out of an enormous pack and cooked lunch between them. I found the whole sit down next to a stranger and then ignore them rather uncomfortable to be honest. I quickly packed, said goodbye and left them to it. The speed at which the weather changed surprised me. It literally felt that one minute it was blue skies and sunshine and the next it was grey and drizzly. I pulled on my waterproof and soon passed the jeans wearing group who had crossed the bridge whilst I was having lunch. They appeared to be struggling a bit under their large packs, stopping to rest every couple of hundred metres or so. 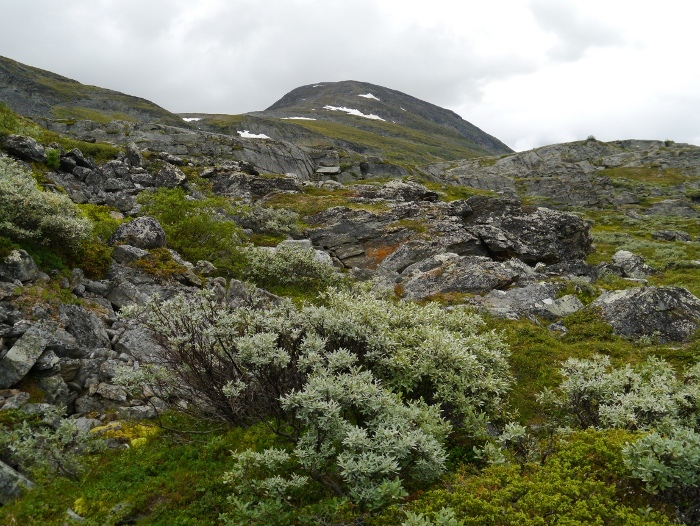 The upper reaches of Visttasvaggi was simply extraordinary, a real timeless almost primeval landscape. I half expected to see some prehistoric animals grazing alongside the river. 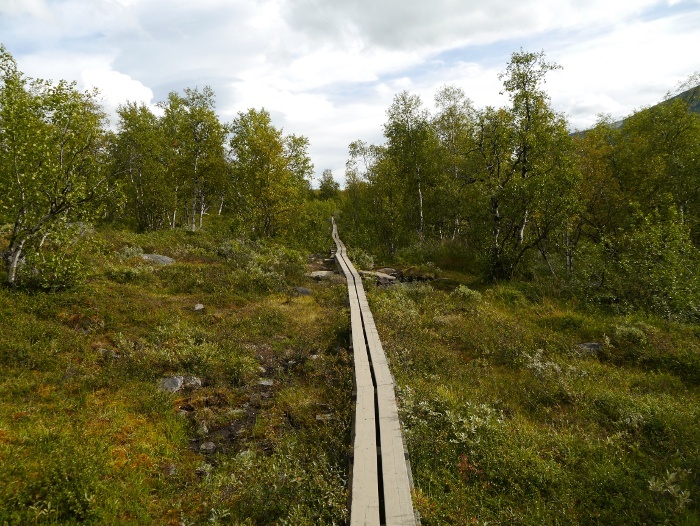 The path passed through areas of birch and thickets, open boggy areas crossed by the now familiar wooden walkways. 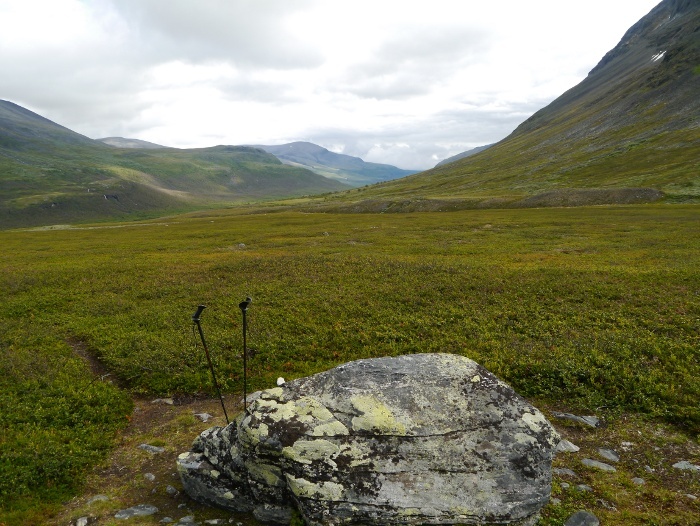 However far from the Kungsleden these were poorly maintained, sections missing and others rotting. 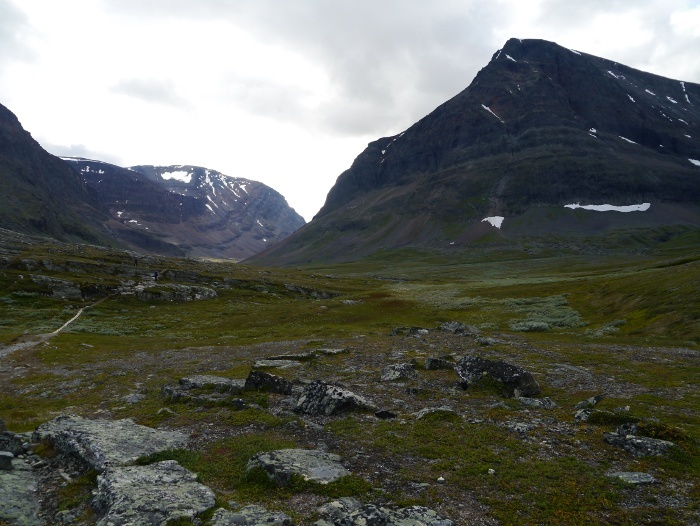 The valley simply got better and better, the peaks to my right rising almost to two thousand metres, vast walls of rock dominating. It was hard to keep my eyes on the trail ahead of me to avoid tripping over. The word awesome is probably vastly overused and I wish that I had a better alternative. 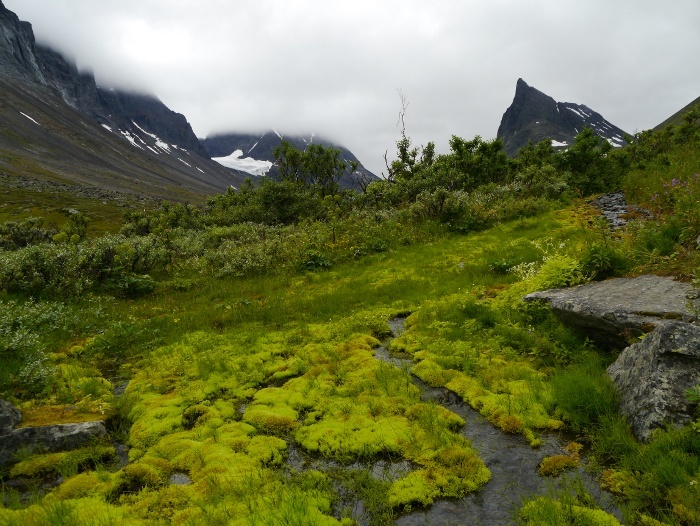 After crossing a large boulder field the valley opened out and I noticed that the vegetation under foot was much more tent friendly. Looking at my map it became apparent that this would probably be my last chance to camp before reaching the STF Vistas hut. I estimated that it would probably still be three hours away and it was already nearly six. The sky to the north was darkening so I found the least prickly spot and pitched the Scarp1. The mosquitos in the warm, humid and still air quickly sent me scurrying inside to unpack, the familiar sound of rain on flysheet soon following. 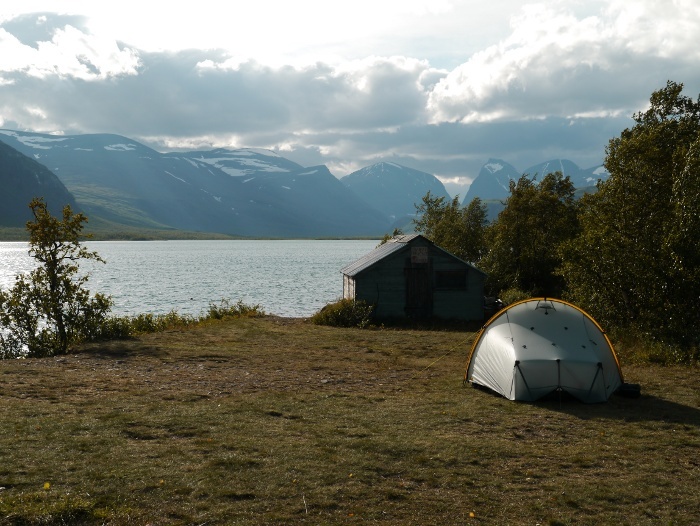 It was an enviable location for a wild camp and I can only just refrain myself from using the word awesome again. 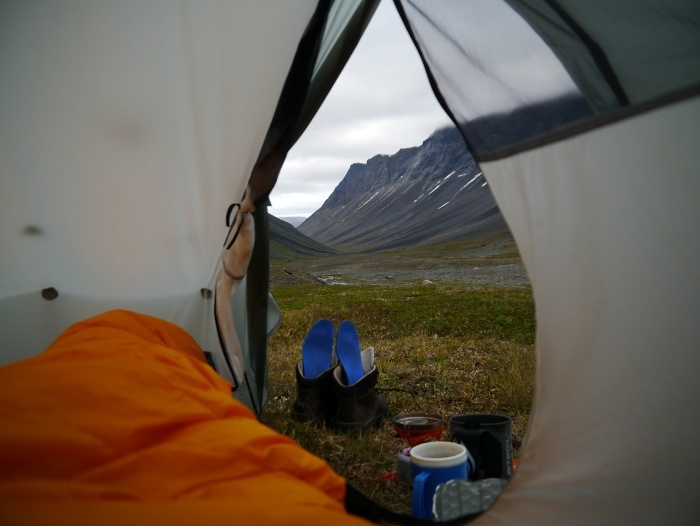 I would love to say that I lay in my tent with the door open, staring up at the surrounding peaks. The sad reality is that my doors were firmly sealed against numerous winged invaders. Removing my baselayer I was in my own personal hell, my back and shoulders covered in numerous yellow and raised bites from the day before. The temptation to strip the skin from my body through scratching hard to resist. An hour later and I heard footsteps pass the tent, I peered out and watched the jeans clad group pass, looking damp in the drizzle. I made dinner by boiling water and adding to an expensive bag of freeze-dried gloop. Amazing that I was camping somewhere so beautiful yet I felt strangely dejected. Drizzly rain continued through the night. Just after dawn there was a huge crack like a gunshot followed by a crash, perhaps a rockfall or a chunk of glacier being overcome by gravity. 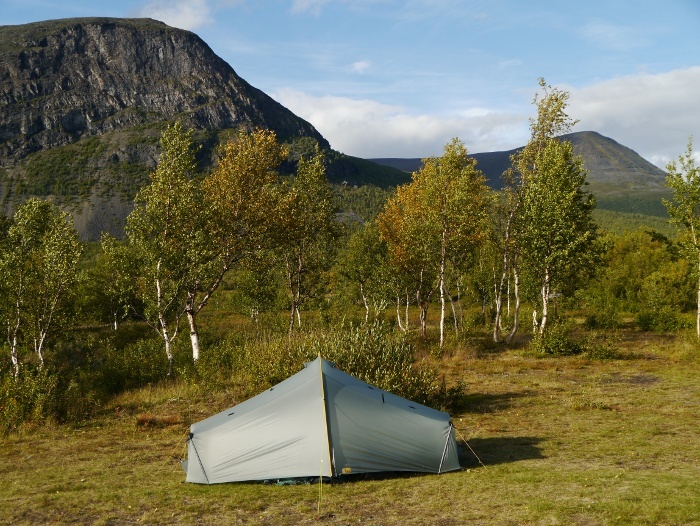 A grouse like bird chuckled and three winged creatures flew low over my tent, startling me. 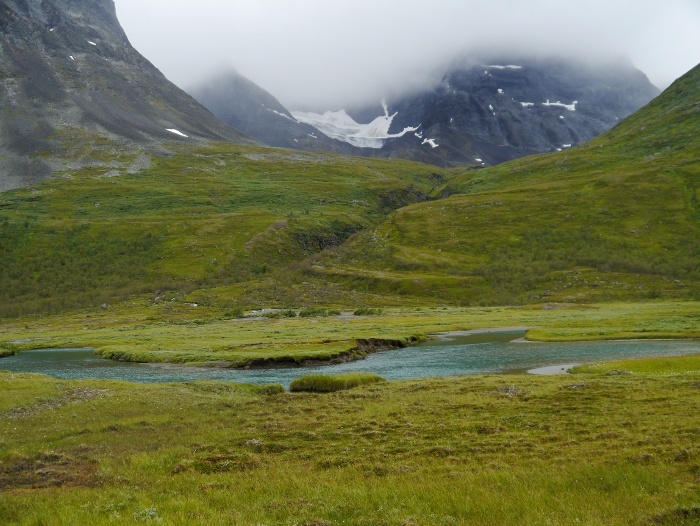 I suddenly felt tiny, all alone in the vast landscape and my mind drifted towards bears. 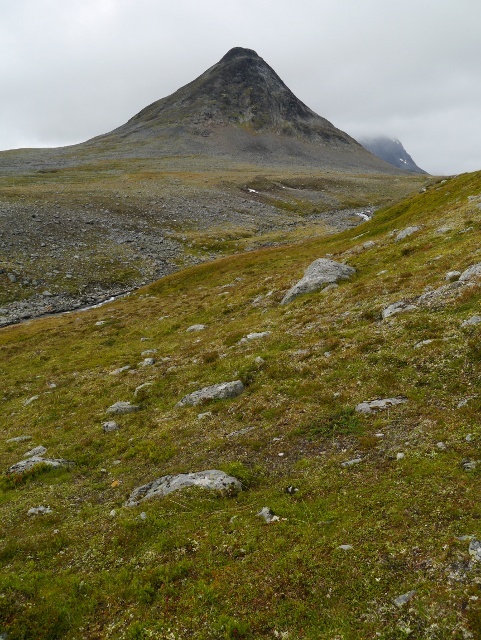 When researching my trip I had read that there are meant to be bears in Visttasvaggi. Any encounter is probably an impossibility but the thought of them played on my mind until I drifted off back to sleep. 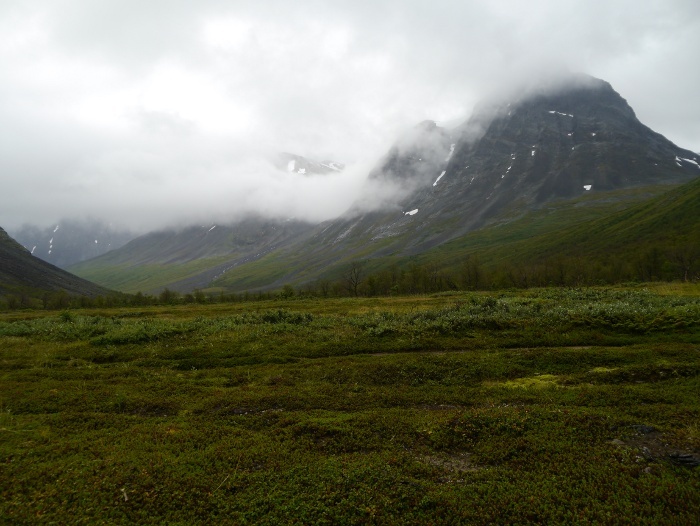 The mountains were shrouded in mist when I finally got up, my waterproof providing armour from a few hardy mosquitos. 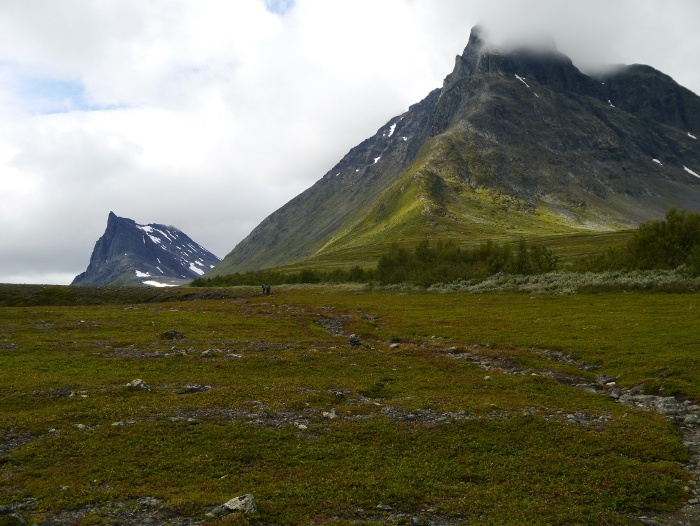 I was passed by a couple of backpackers who had camped half an hour back up the valley. Yet again one of them was dressed in rather damp looking jeans, just the thought of denim related chaffing made me wince. 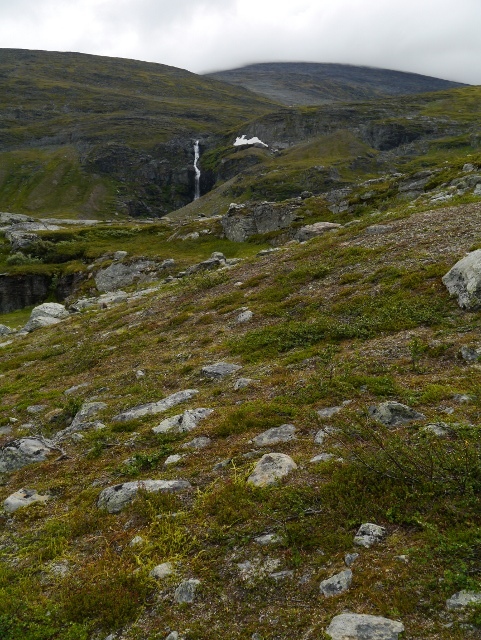 The rain soon stopped although the clouds on the hills were still boiling and churning away, occasionally revealing a glacier. The going through the valley was surprisingly tough and I was glad that I had not attempted to get to the hut the previous evening. 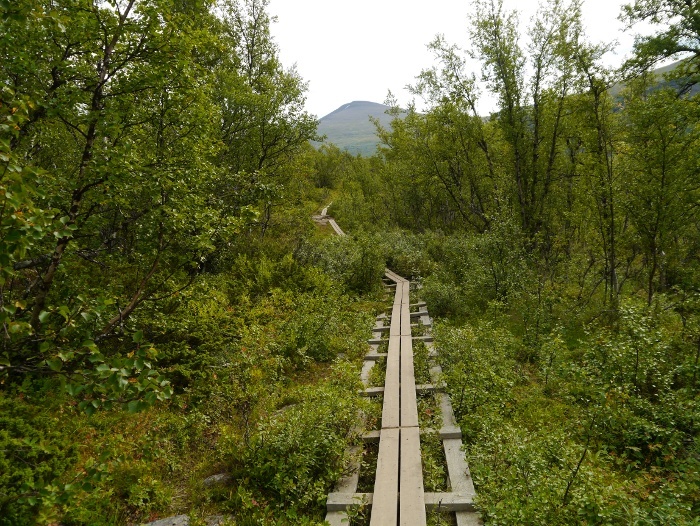 The narrow twisting trail wound its way though boulder fields, open bog and thick areas of birch. There were constant small ups and downs, roots and slippery mud making the walking slow and tiring. 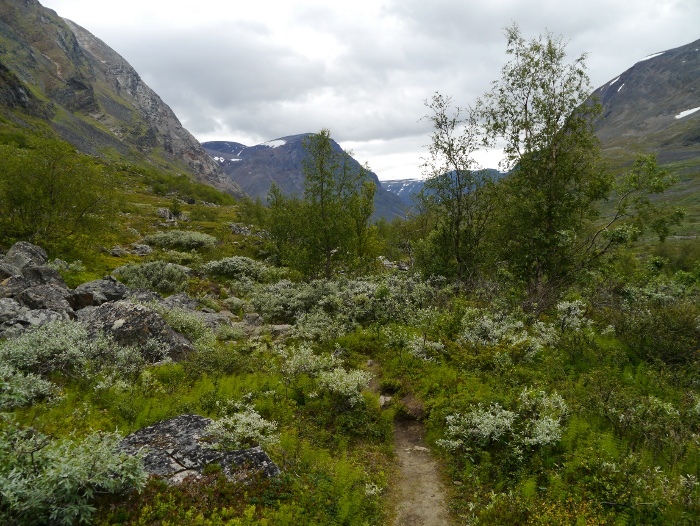 The further down the valley I got the more the birch forest dominated until it ended up a muggy tangle of vegetation. The atmosphere was thick and humid and the mosquitos hungry. My initial glimpse of the peak Nallu lifted my spirits. Firstly because it meant that the Vistas hut was near and secondly because it is just so damn impressive. A tower of rock that would dominate the rest of the day. 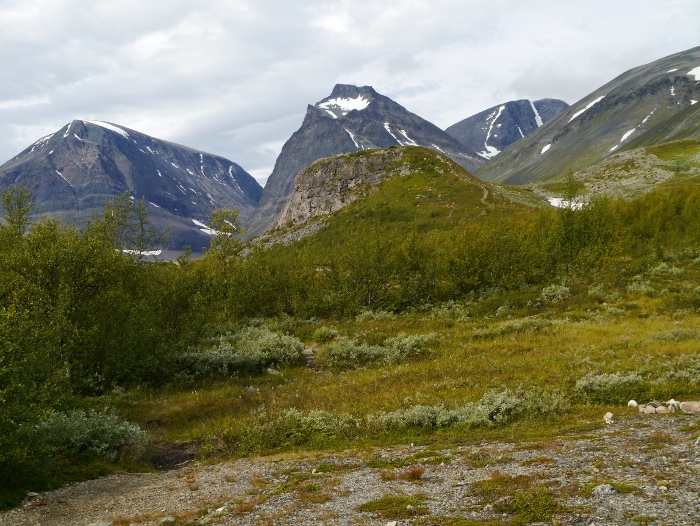 The STF hut at Vistas provides a small amount of civilisation in the wild Visttasvaggi valley, thirty four kilometres from the road head at Nikkaluokta. It would be a long walk through the endless mosquito infested birch forests to get here from that direction. I had planned to buy some supplies as it has a small shop. I started out with enough food to last five to six days but wanted to stock up with biscuits and noodles. Unfortunately the warden had gone out for the day and the shop was locked. They had left a few items in the porch along with an honesty box. I enjoyed a sugar fix with a can of coke on the front steps but there was no food light enough to carry. 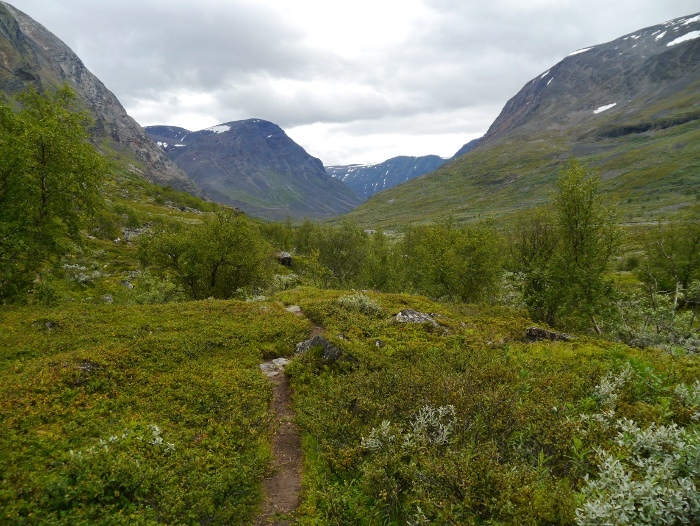 After quickly exploring the accommodation on offer (pretty good considering the remote location) and using the rubbish bin I shouldered my pack and headed towards the river. A swaying suspension bridge crossed the now considerable river giving grand views back the way I had come, cloud beginning to lift from the mountain tops. I passed the three lads from the day before who were taking down a rather large tent, this time I received a friendly wave. 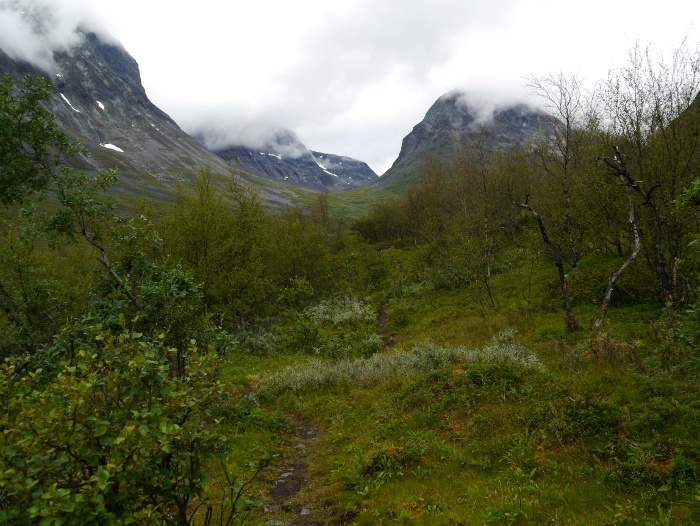 I was now on a different trail that would eventually lead back to the Kungsleden nineteen kilometres away. It was these nineteen kilometres that I was looking forward to the most on the entire trip. 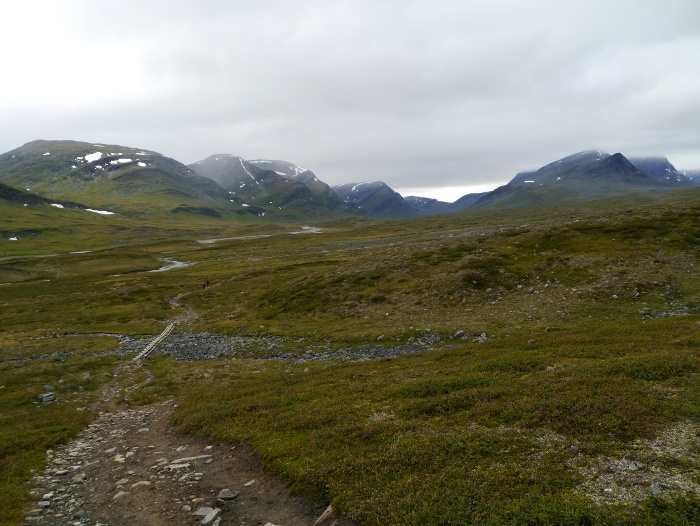 A narrow path took me across flat open ground before starting a steady climb into Stuor Reaiddavaggi. 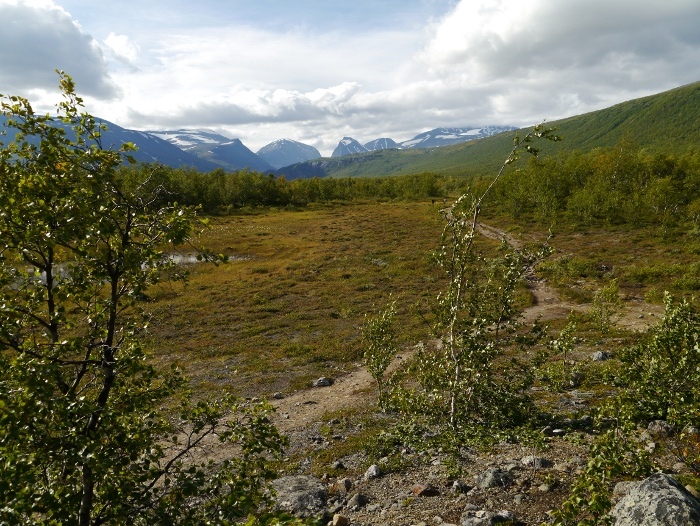 The view back down the valley was vast, the birch forest along the flat valley floor seemingly endless. With a bit of height the true wonders of Stuor Reaiddavaggi began to reveal itself, the leading cast already hogging the limelight and taking centre stage. A final glance back towards the Vistas hut, a familiar landscape was being left behind. 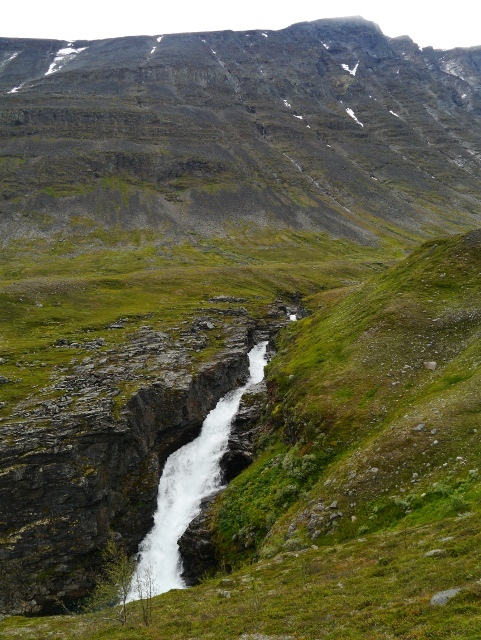 I was now entering a tolkienesque world of jagged peaks puncturing the sky, waterfalls, rocks and glaciers. I wish that I had brought my iPod as Sigur Ros would have been a perfect soundtrack to accompany the visual feast. 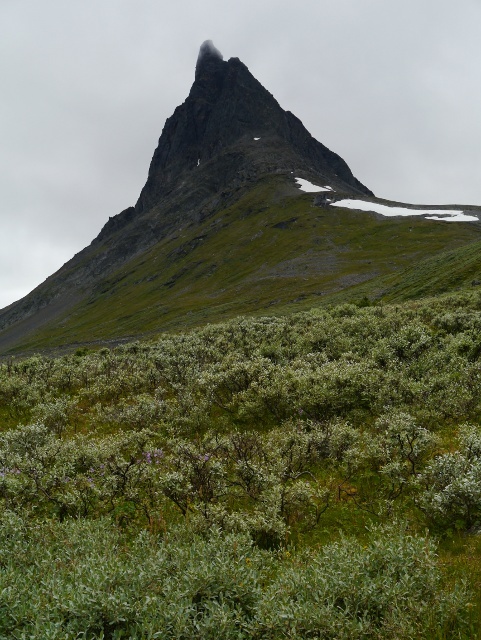 The further I climbed into the valley the more the peak of Nallu began to dominate. 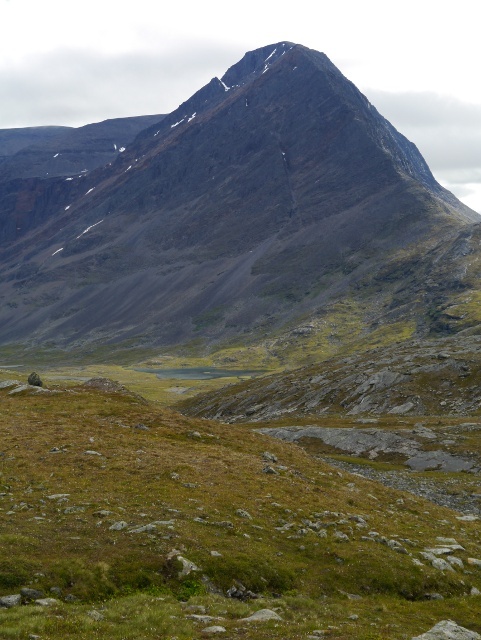 It is only 1585 metres high, much lower than many of the surrounding peaks. What it lacks in stature it makes up in its rocky architecture, a jagged spire pointing into the sky. 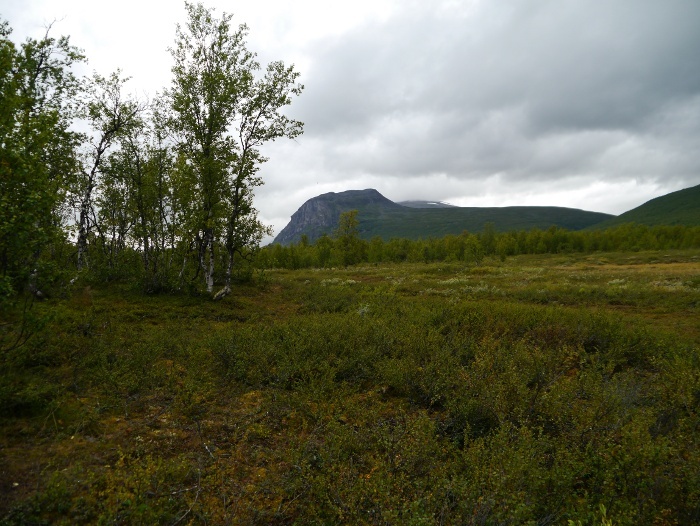 It sort of reminded me of a Lapland version of Suilven as that spire is in fact the end of a ridge, from other viewpoints it is more of a whaleback mountain. My camera barely got put back in its protective case for the rest of the afternoon. Just past a long boggy section where electric green moss contrasted vividly with the many greys on offer, I found a dry spot to sit and eat a late lunch. The three young lads had been tailing me for a couple of hours. Once again they sat down next to me, this time engaging in some pleasant conversation. They were from Germany and I think that they had just been a bit shy rather than standoffish. I was by now a familiar figure who could be talked to! 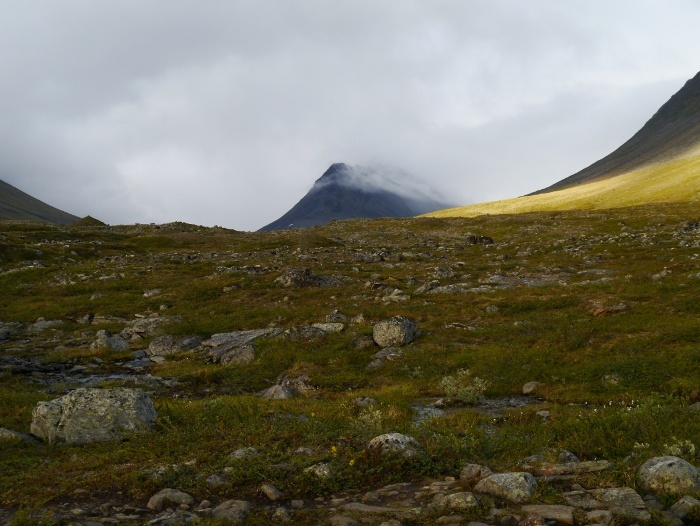 They said that the jeans wearing group the day before had reached the hut totally exhausted just before dark. They had a bus to catch meaning that they would need to walk the entire thirty four kilometres to the road in one day. The chance of them staying on schedule were looking very slim. 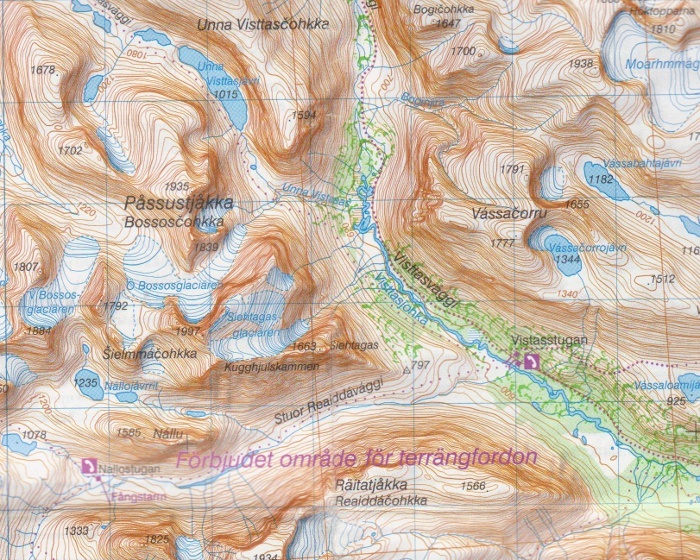 The three German lads were hoping for some clear weather the following day as they planned to climb Nallu. I crossed my fingers that they would get it, a great sounding expedition. Continuing up the valley my surroundings got much starker, vegetation having to fight with bare rock which was starting to dominate. 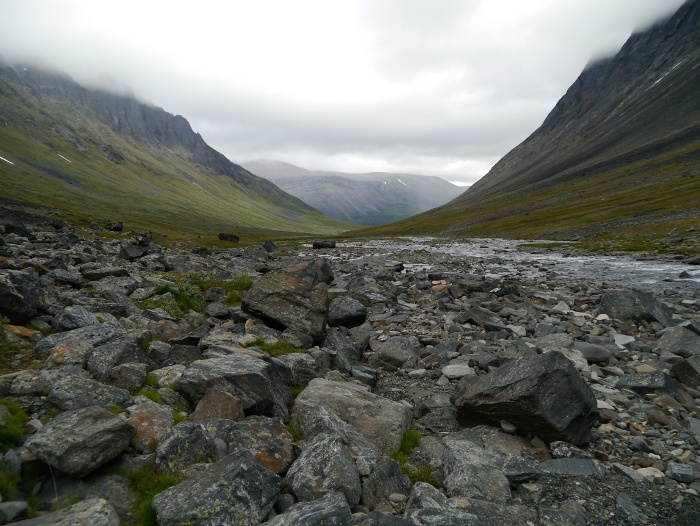 The boulder fields were tiring and I was glad that I had decided not to trek in trailshoes. 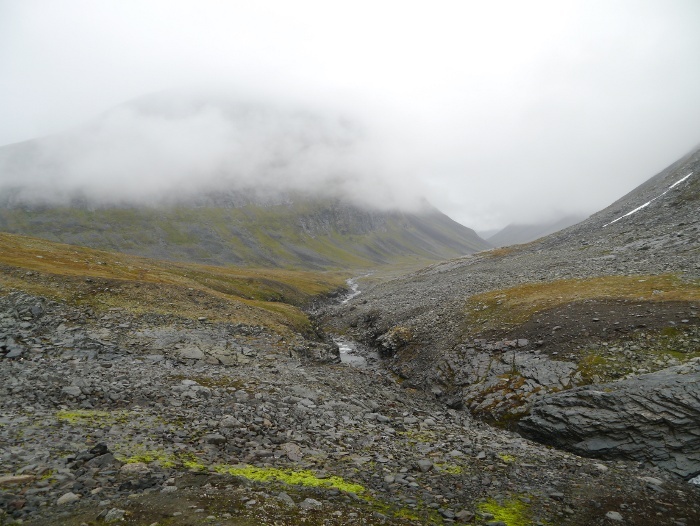 A glacier hung high on the other side of the valley, most of it hidden in the clouds. I heard a crack and looked up just in time to see a couple of large rocks bounce down the cliffs below. 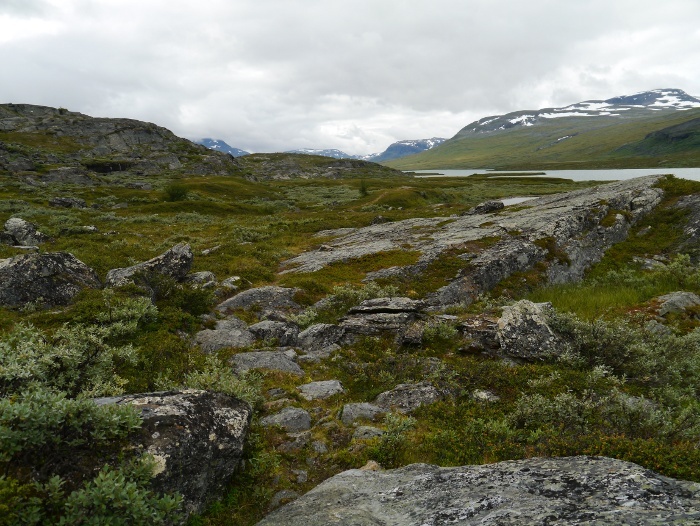 I was walking through a constantly moving landscape. 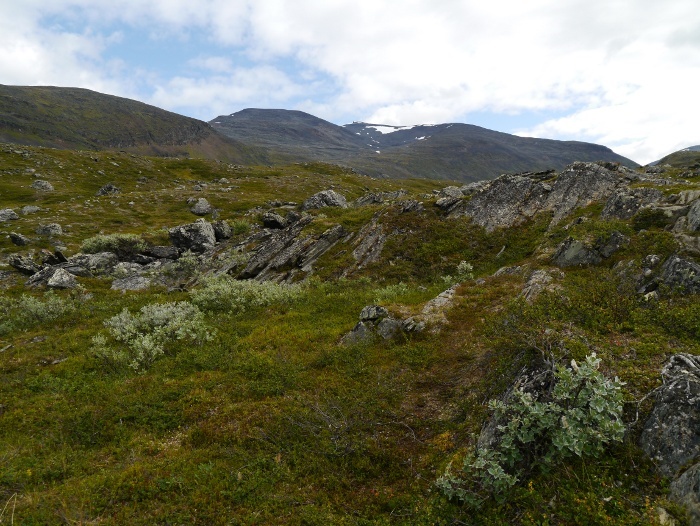 The STF hut of Nallo soon came into view, sitting amongst a lunar landscape. 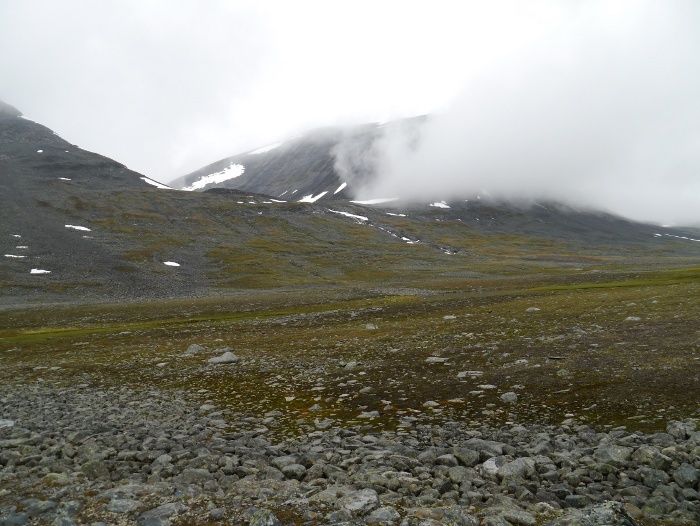 At over 900 metres the temperature had dropped significantly and although tired the cold kept me moving. 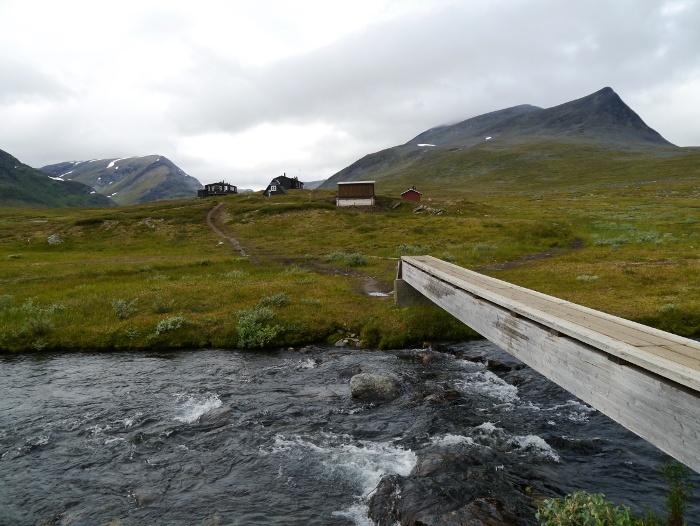 The hut sits on the other side of the river, with many braided channels at the crossing point. 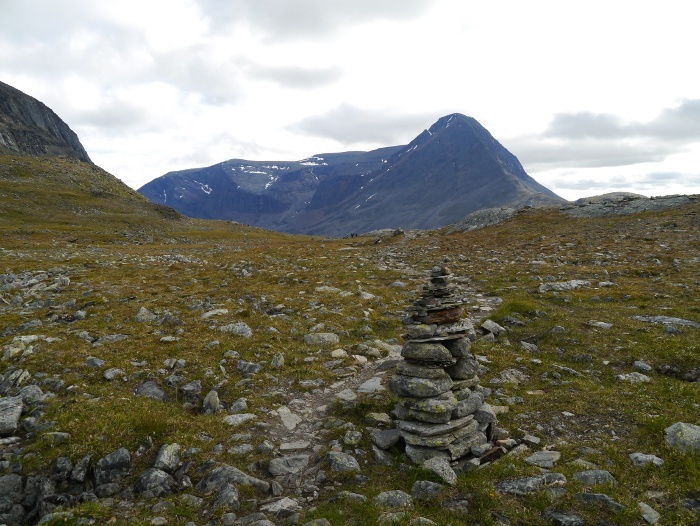 It was wide but the easiest route was marked by cairns meaning that I got across with dry feet. I left my pack outside the hut and went into the almost overwhelming heat inside. It felt overly busy inside its dark confines, its occupants preparing their evening meals. After four days on the trail without a wash or changing my clothes I was aware that I stank. 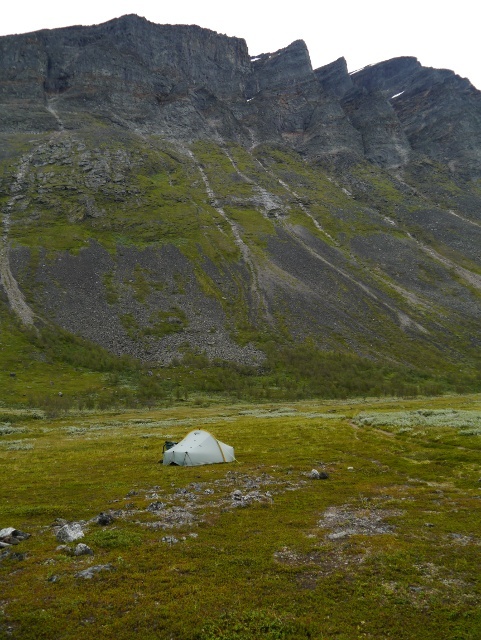 I found the warden and asked about good places nearby to camp as I decided I did not fancy staying the night. She was exceptionally helpful and pointed me further up the valley. 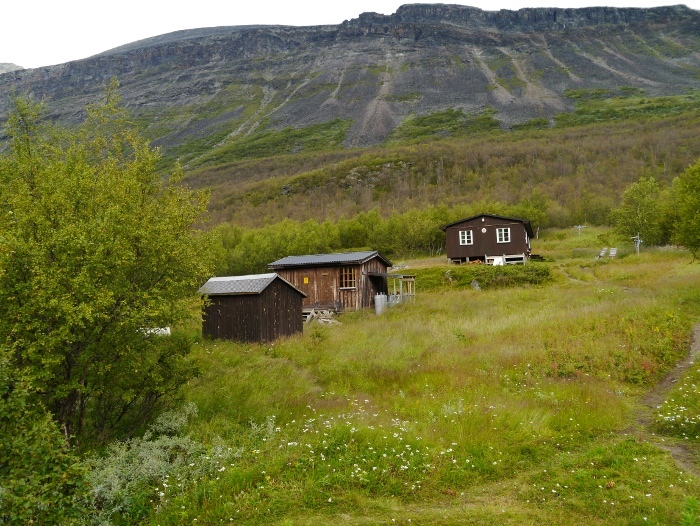 She said that the nine people already in the hut was an August record for a night there. With the weather dry I was glad to escape back to my own company for the night. I climbed for ten minutes up the hill and found a relatively flat spot above the river. There was a cold wind blowing but the view from my tent was exceptional, worth a bit of buffeting. I managed a ‘Jetboil bath’ in my tent, a soapy j-cloth around my body with warm water. It removed some of the stink building up. The same clothes went back on though. Unlike the night before I enjoyed the evening immensely, laying in my sleeping bag with the door open, drinking in the view. Spirits were high and I was looking forward to the following day and the highest section of the trip.